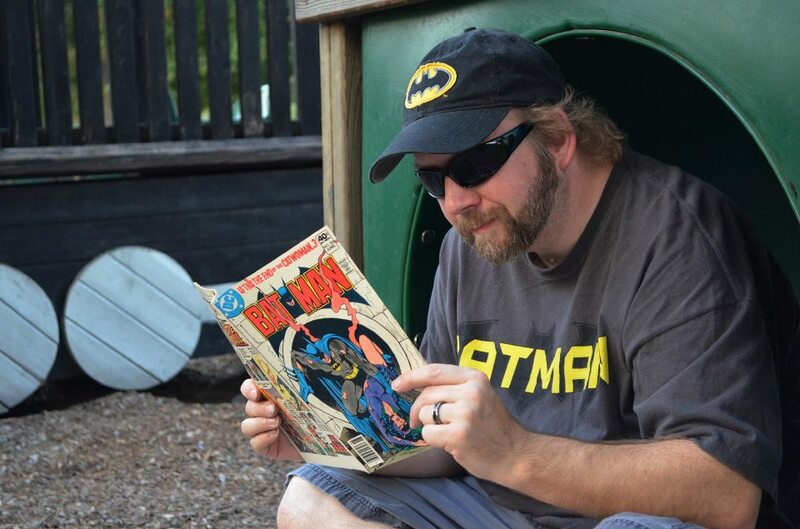 I’ve been a big Batman fan pretty much all my life and have had a few different “Batcaves” to hang out in over the years (bad pun intended). The first one was in a tiny back bedroom of a small 2 bedroom house in Memphis I was renting from my grandmother. 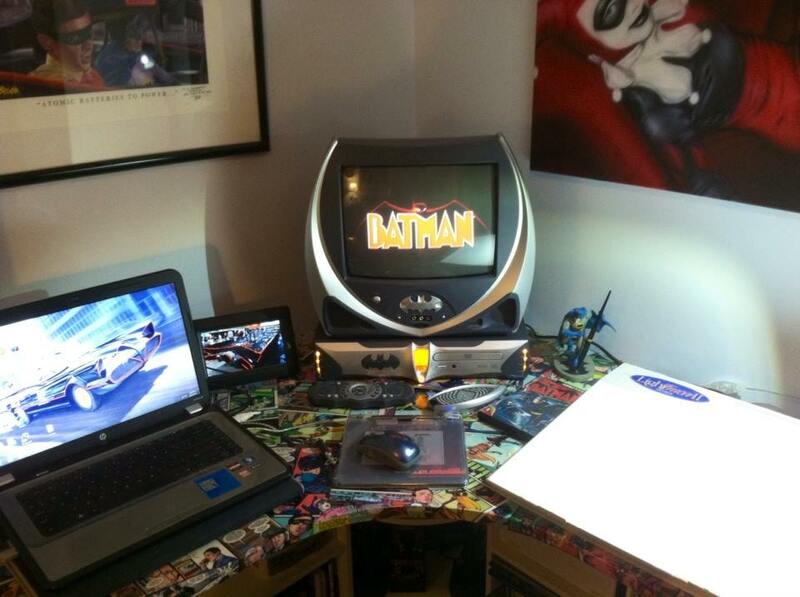 It was around the time of the ’89 “Batmania” surrounding the Michael Keaton/Tim Burton Batman movie. Lots of bat-logo guano and movie related items were readily available just about everywhere I wend. My collection quickly went from a few old toys, to model kits, action figures, posters, Hot Wheels, glasses, buttons and other collectibles. 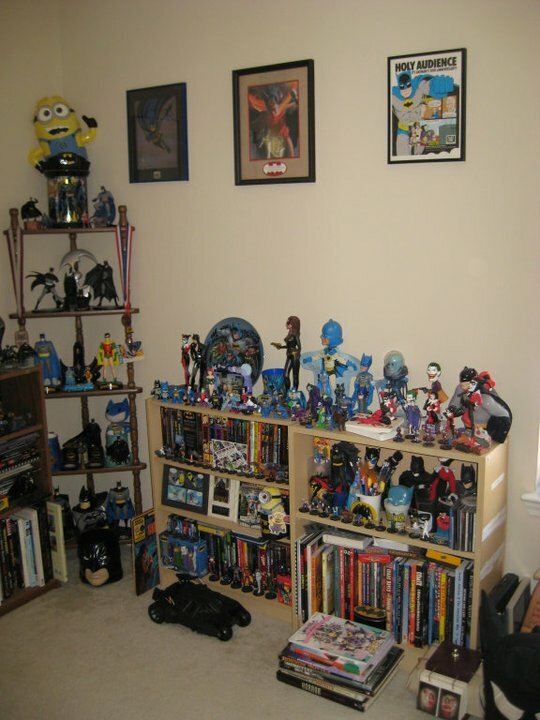 A few years later I bought a slightly bigger house across town and moved the Batcave into the big middle bedroom (photo above). 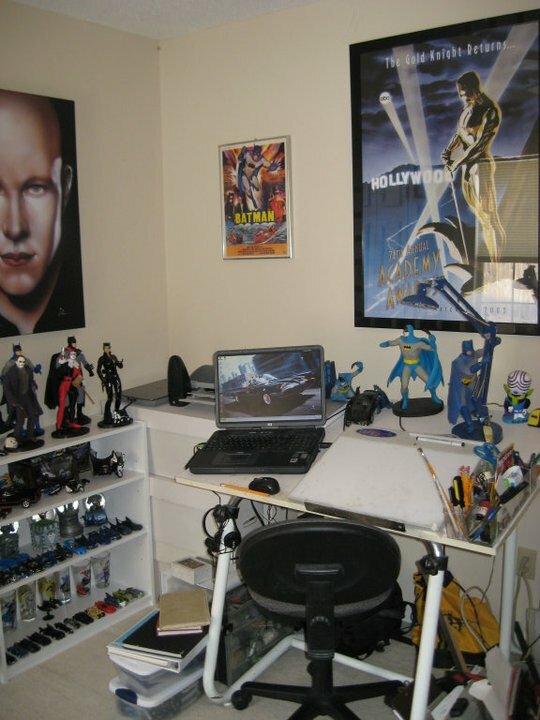 At first I had a spare bed in there for guests and to read comics on, but later moved it out and moved in a desk and a computer to do cartoons and freelance t-shirt designs on. 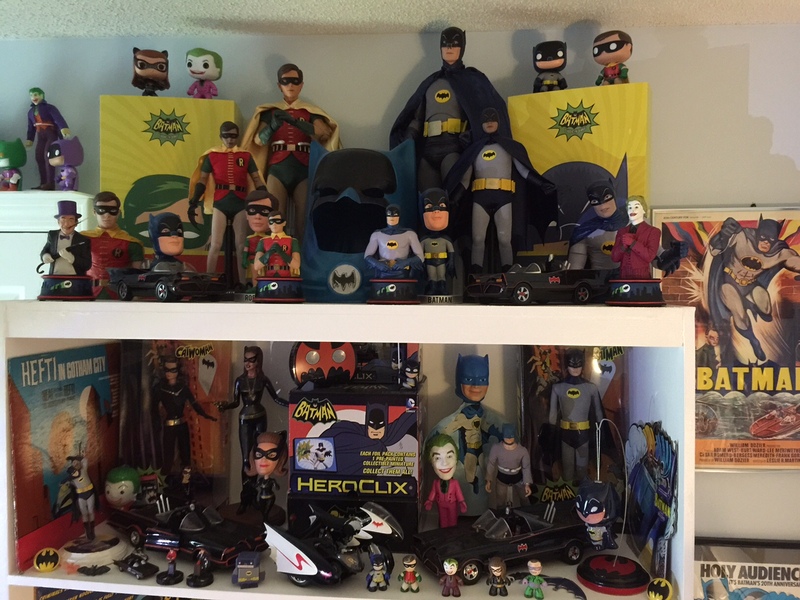 Slowly the Batcave collection started to move into other parts of the house…surprised I didn’t end up on an episode of “Bat-Hoarders”. 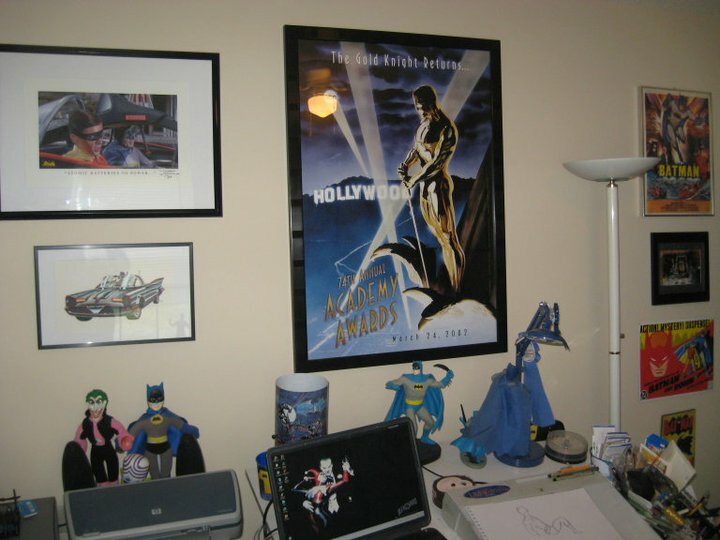 …some framed comic art (comic pages by Joe Staton/Terry Beatty and Steve Rude, and a toon by friend Sam Ray), and a lot of collectibles and art books. 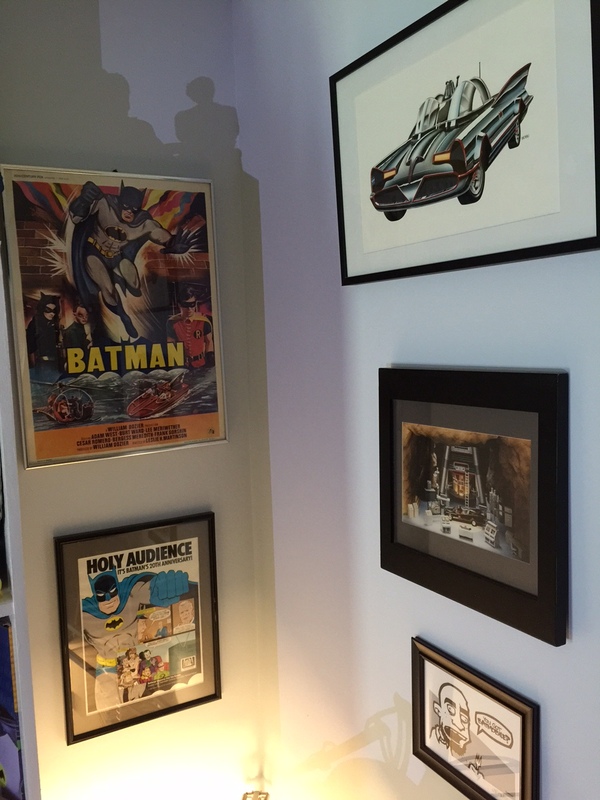 Later I added some more framed art by my friends (and fellow bat-fans) Steve Stanley (top left) and Bob Kimball (bottom left) over my art table. 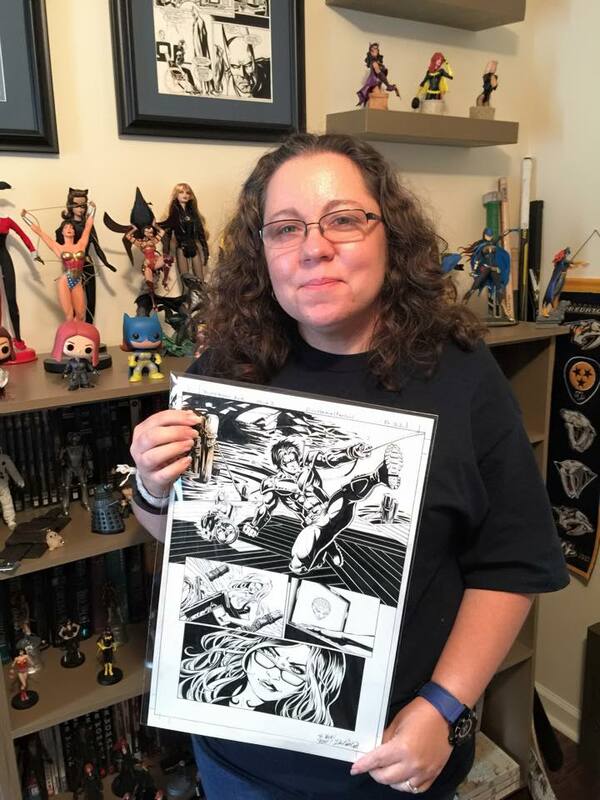 I had gotten the Steve “Atomic Batteries To Power” print from our mutual friend \S/tephanie Perrin– both are friends I met in Metropolis, IL over the years. 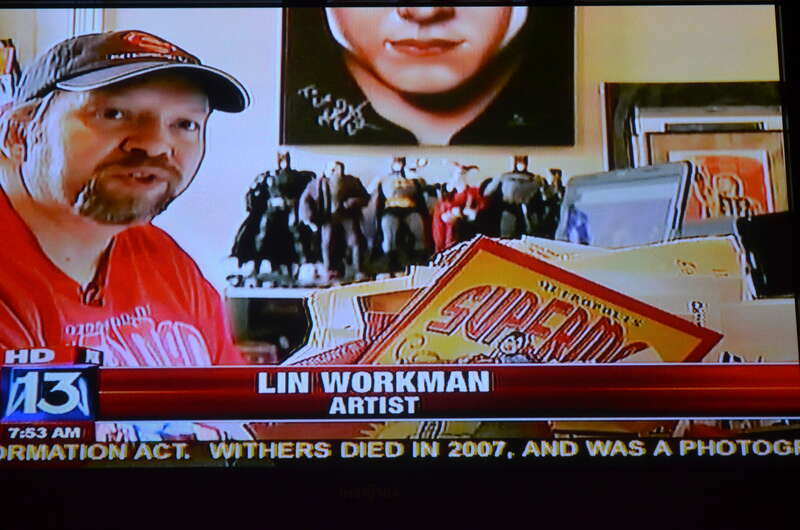 Steve was responsible for me getting invited up to the Superman Celebration as an artist guest back in 2005. 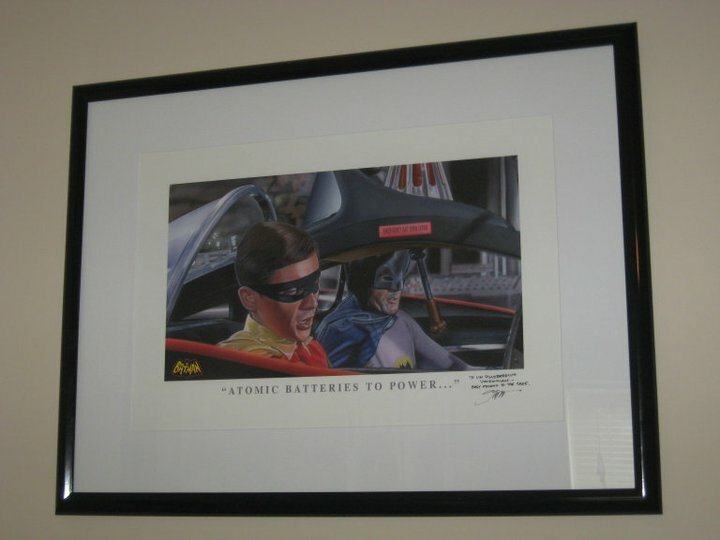 The Batmobile airbrushed illustration (and a lot of my early bat-collection including some vintage posters, prints, Mego figures, Super-Powers, and a batarang) I got from Bob during one of his many moving adventures. Each time I helped him I would buy some items and be given others to take home. 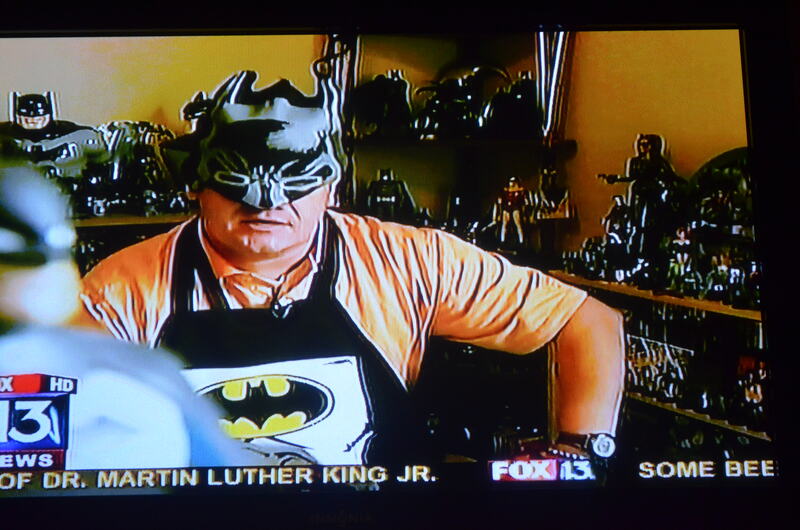 One day back when I was freelancing from home and working on a t-shirt design for the Metropolis Superman Celebration, Fox13’s Tom Dees and Derek Curran stopped by the cave for a quick interview. Always a lot of fun to hang out with those two. We spent several nights clowning around together scaring folks at one of the local haunted houses. Hey- it was for charity! 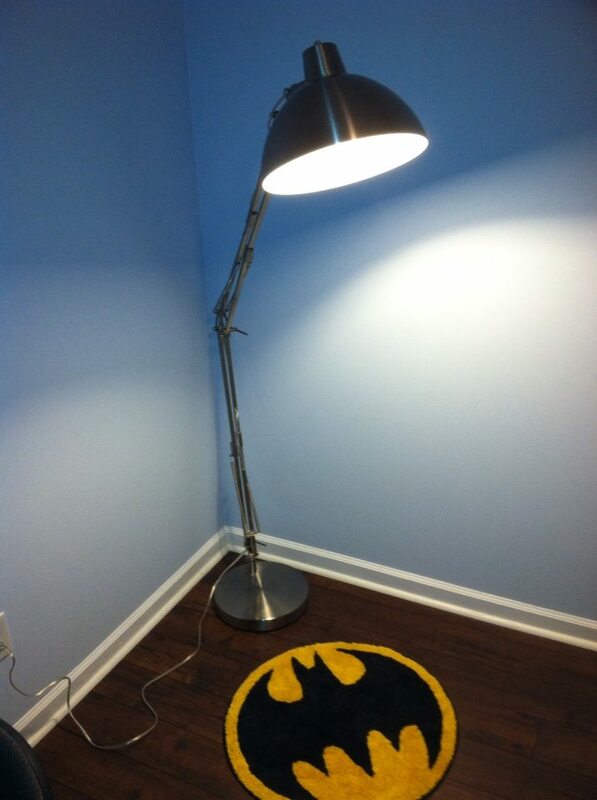 I had been wanting to re-do the Batcave- repaint, build custom display shelves and work station, etc., but we needed to save up to have the carpet pulled up and add new floors throughout the house. 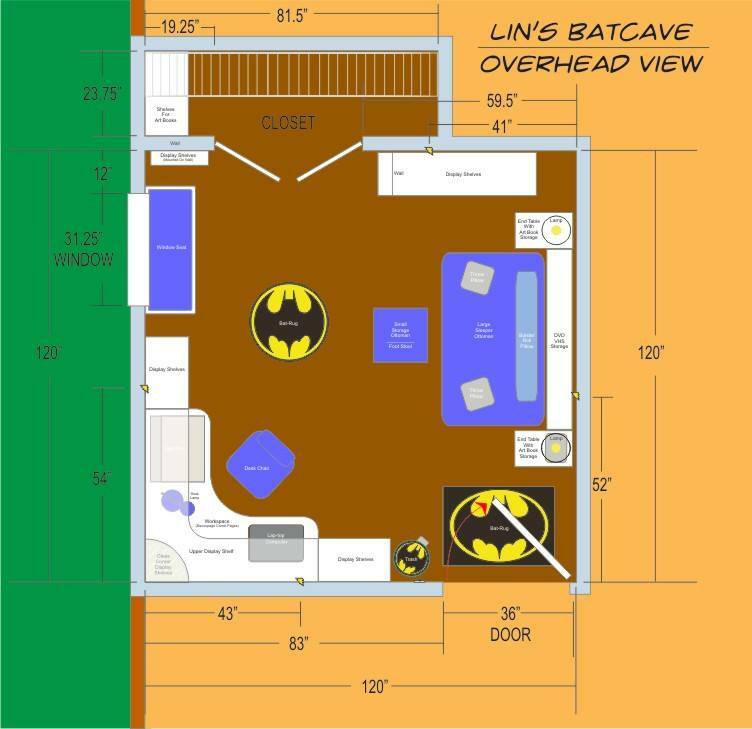 There was also the cost of materials to do the Batcave project. It took a while to save up (and pack up! ), but we finally were able to start making it happen last summer. First thing I did when envisioning the new space was take measurements and create a floor-plan in the computer. Much easier to move virtual furniture around. 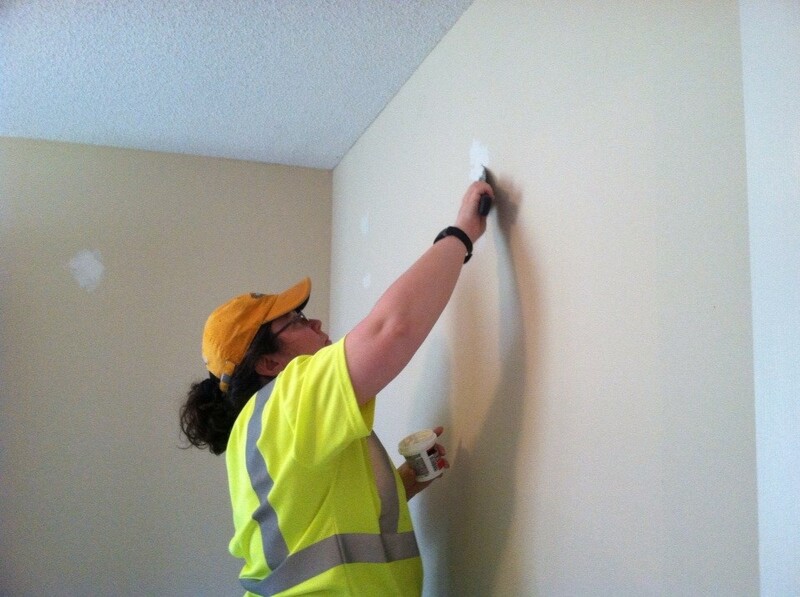 After all the collectibles had been packed up and furniture had been moved out, Nicki and I started filling nail holes and other wall flaws. I hate prep work, but it’s a necessary evil. 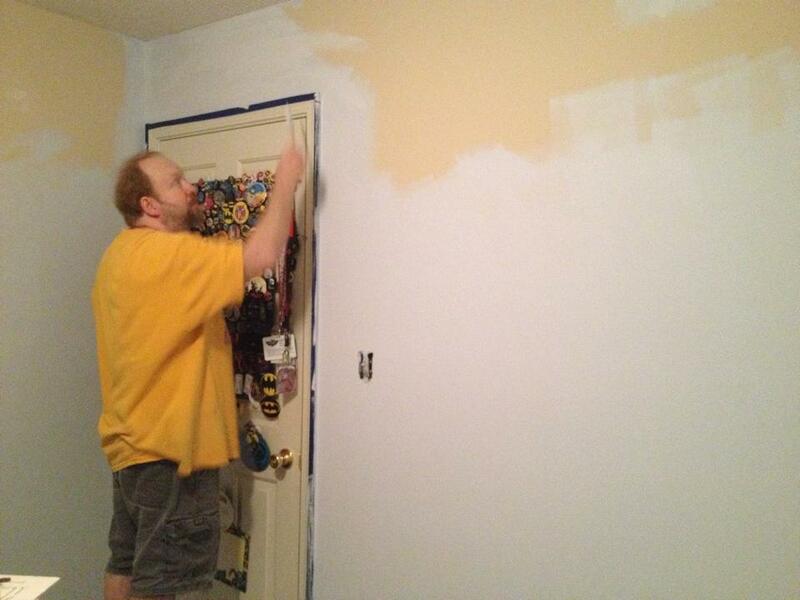 The walls had been a neutral beige, but I wanted more of a brighter light blue/grey color. 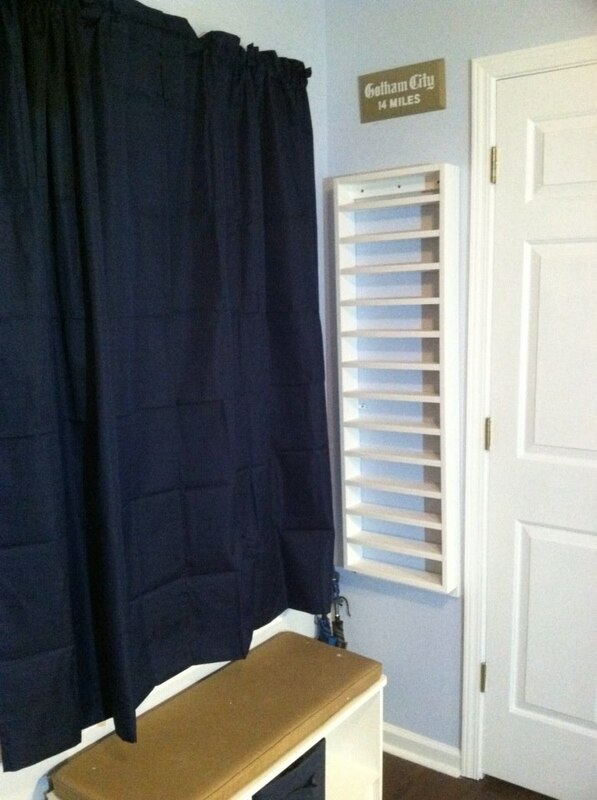 Something that would go well with the white shelves I was planning to build. 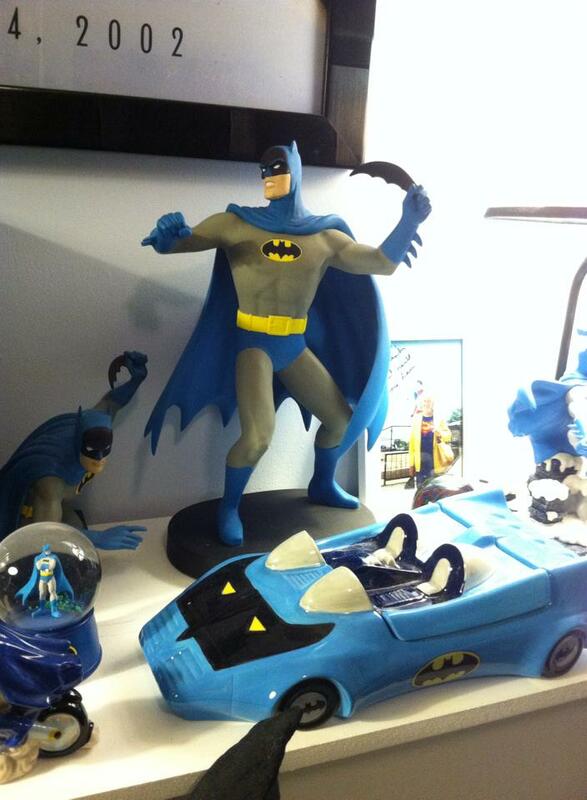 Wanted to go with white to help lighten up the room, as well as be a good contrast for most of the black and/or blue bat-collectibles. 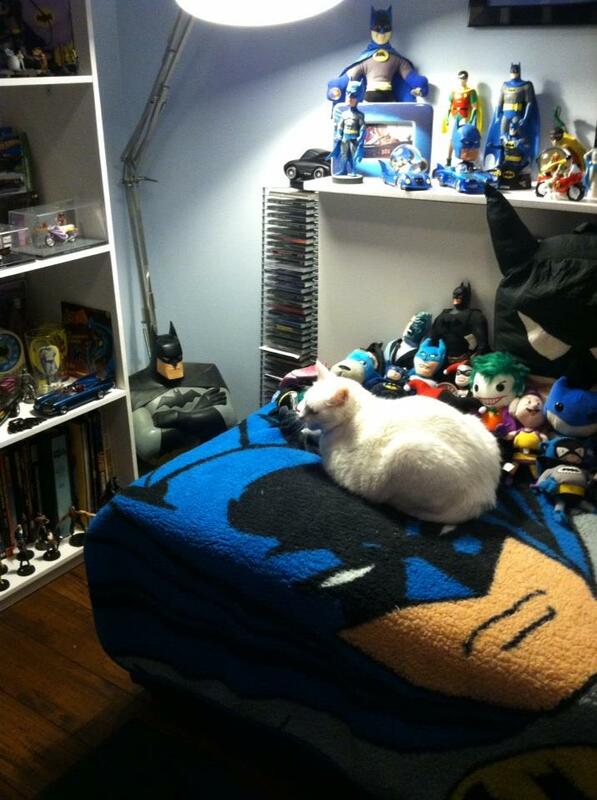 When I visited Bob’s cave years ago he had white shelves and I always dug the look of them. My friend Tim Brown helped me install a white ceiling fan in the Batcave (and a new brown one in Nicki’s room) a couple years ago when I took possession of the room. It’s now the most comfortable room temperature wise in the house now. It was good to see the carpets finally go away. The family before us had kids and their were quite a few permanent stains. Plus I just hate beige carpet, and threatened many times just to rip it all out and paint or stain the concrete underneath. Instead we hired professionals and went with a hardwood laminate in all the rooms except the kitchen, bathrooms, laundry, and front entry. We went with new porcelain tile in those spaces. Major improvement, and they were able to install it in a couple days. Nicki stayed home to cat wrangle while the workers invaded the house. 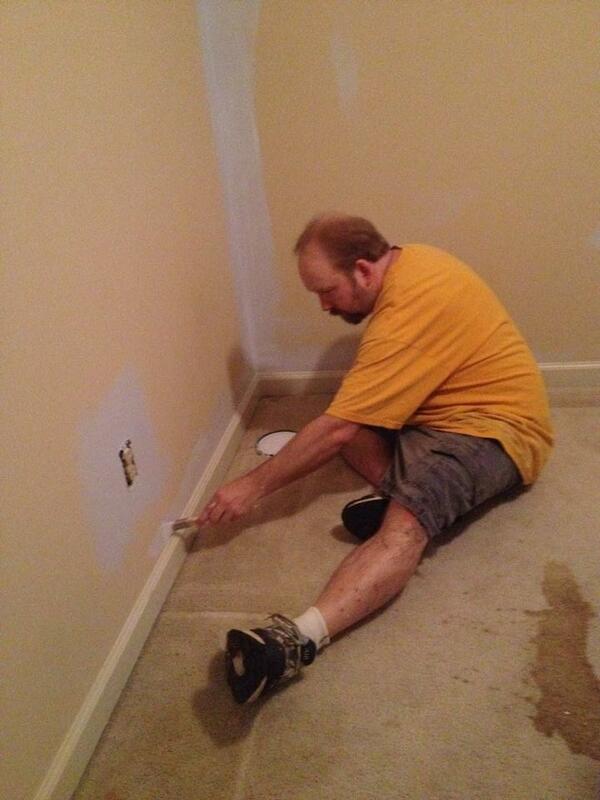 We did as much painting as we could before the floors were installed, and it was nice not to worry about dripping any on the carpets! We used MDF (medium-density fibreboard) for most of our construction, and built the shelves out in our garage and driveway. 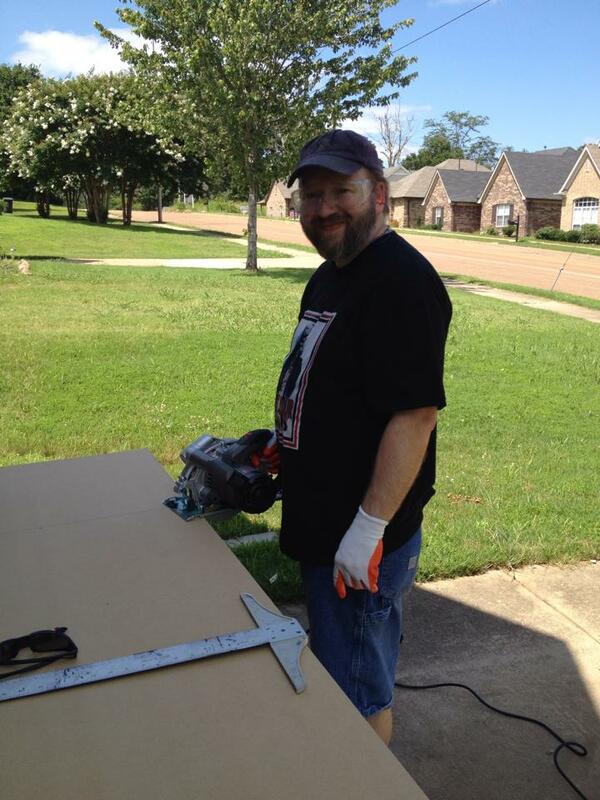 It was pretty easy to cut with a jigsaw or circular saw, but I do recommend wearing a dust mask, work gloves, and safety glasses- as well as measuring twice (or three times or more) and cutting once, investing in saw horses and metal yard sticks. After the first day or so of building outdoors, we decided to pick up a 10’x10′ tent to help with shade and cut down on the “redneck” sunburn effect we were experiencing. That helped a lot, and will come in handy in the future for other things. I tried to make the most of my “free time” from work. 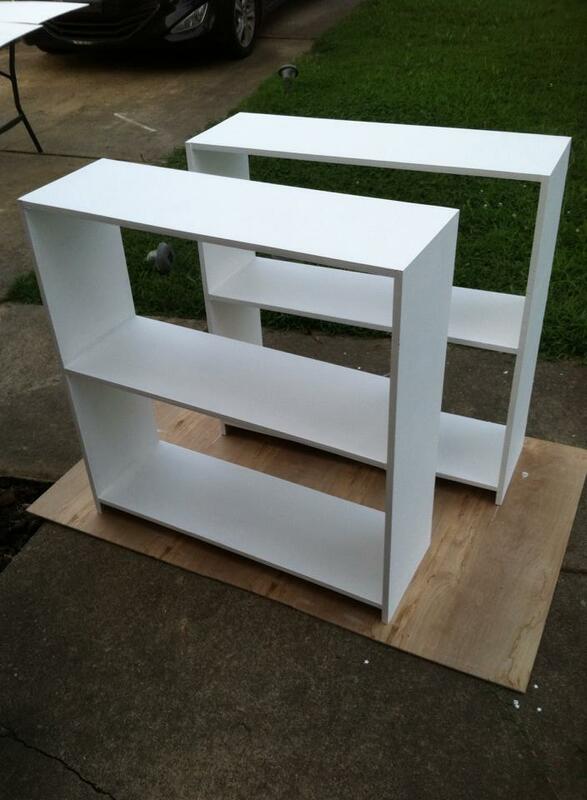 Weekends and after work were spent building one shelf unit after another. 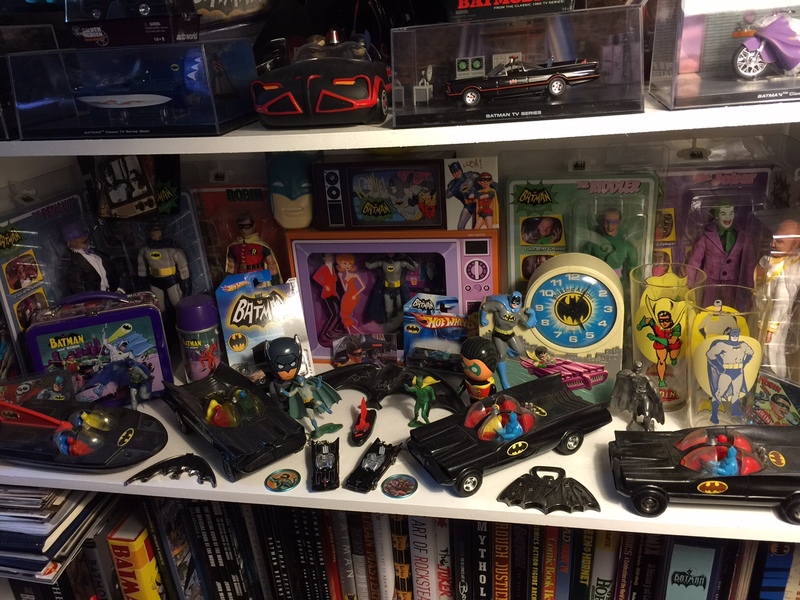 I had a lot of bat-stuff to display! Sometimes I would work on two or more shelf units at a time. 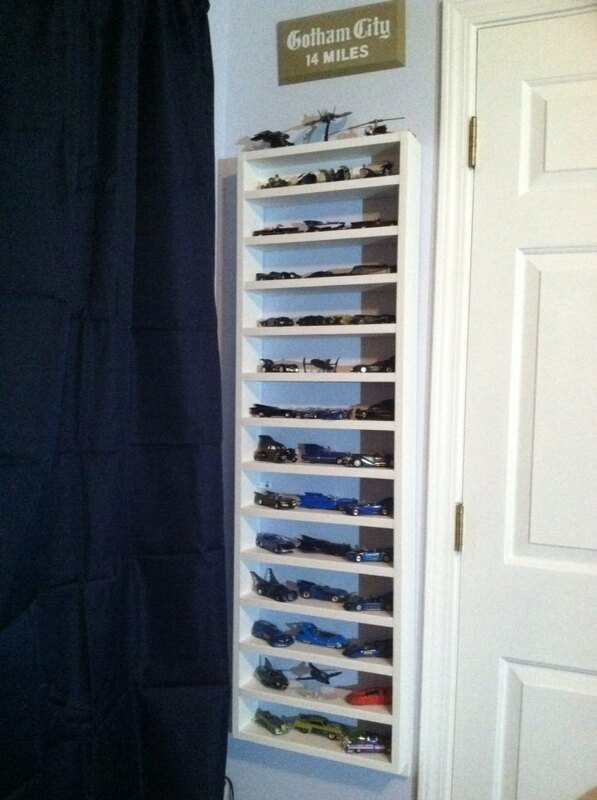 The first one I finished was my big display shelf for the corner near the closet (above). 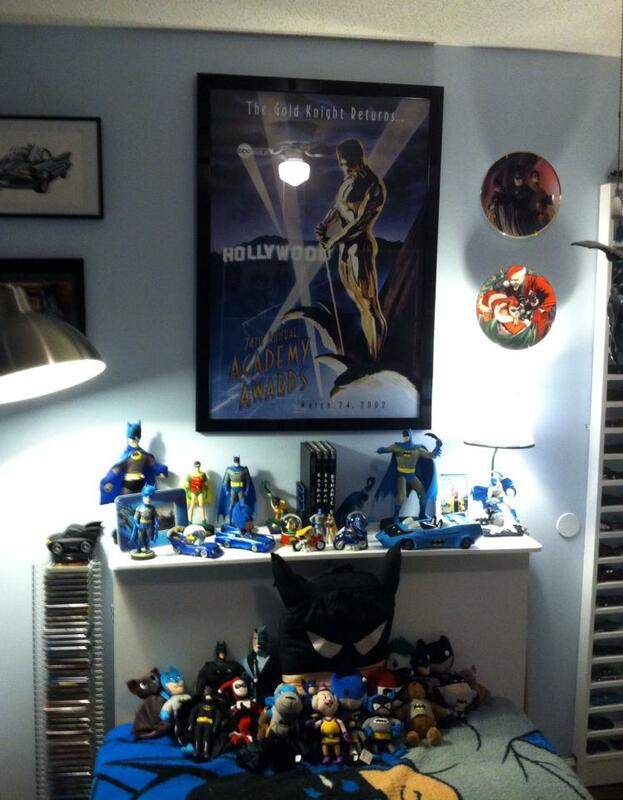 This was the space I used to have a small 3′ tall/wide shelf, and would be home for most of my ’60s TV bat-memorabilia. 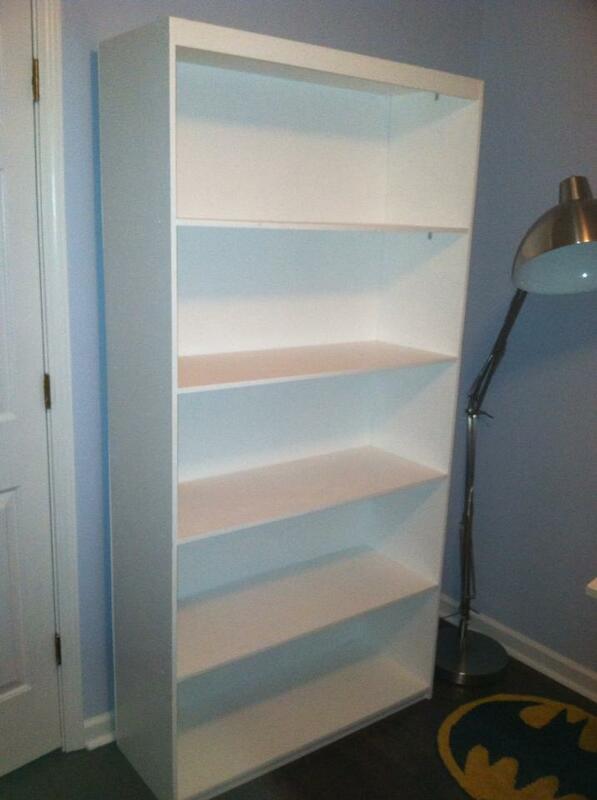 It was pretty simple but sturdy, and didn’t have to be exactly like any others in the room. Some shelves, like the tall and short ones that would make up my new work space each had to have an identical twin built. I made sure to run support pieces on the bottom to help handle my heavier art books. Once assembled and sanded, I primed and painted them. I was amazed when they came out level! Since we hadn’t done this sort of thing before, we had a bit of a learning curve. It did get easier as we went and I discovered some shortcuts and tricks to making the build go smoother and quicker. 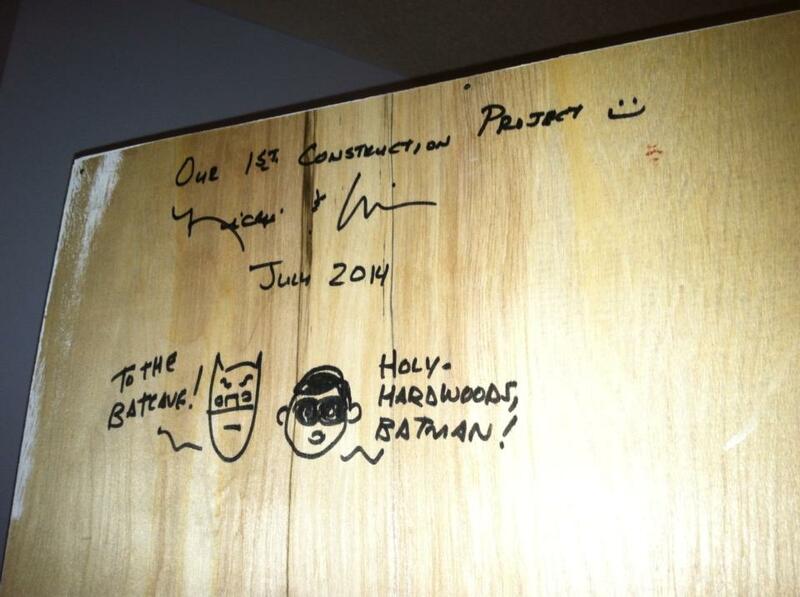 We were so proud of doing a home improvement project and not getting divorced or killing each other in the process that we had to celebrate and sign the back of our newly finished piece of furniture! The pieces also ended up looking very similar to a pre-fab window seat I had purchased earlier when I first took over the space. You can’t tell I didn’t make it when I made the others, and it has some curves to it. 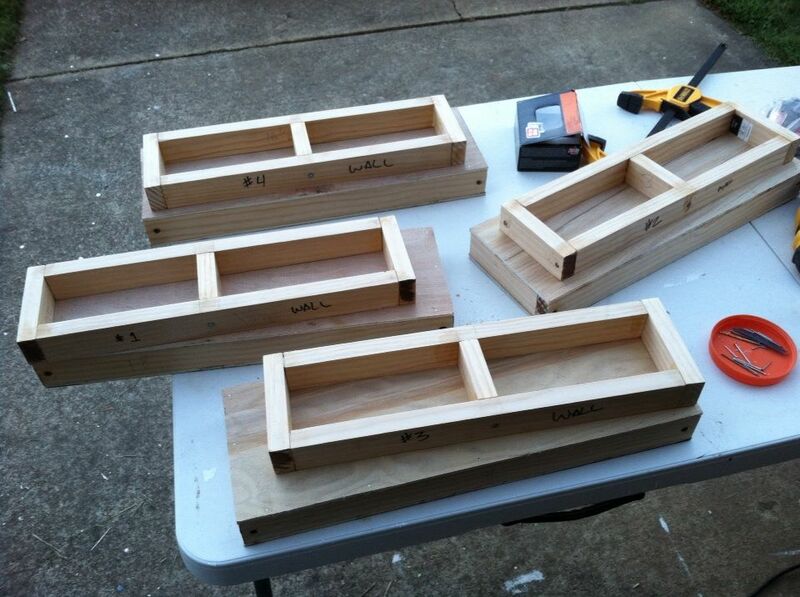 I’ll end up making a slip cover for the seat cushion and the shelf spaces below will hold trade paper backs. 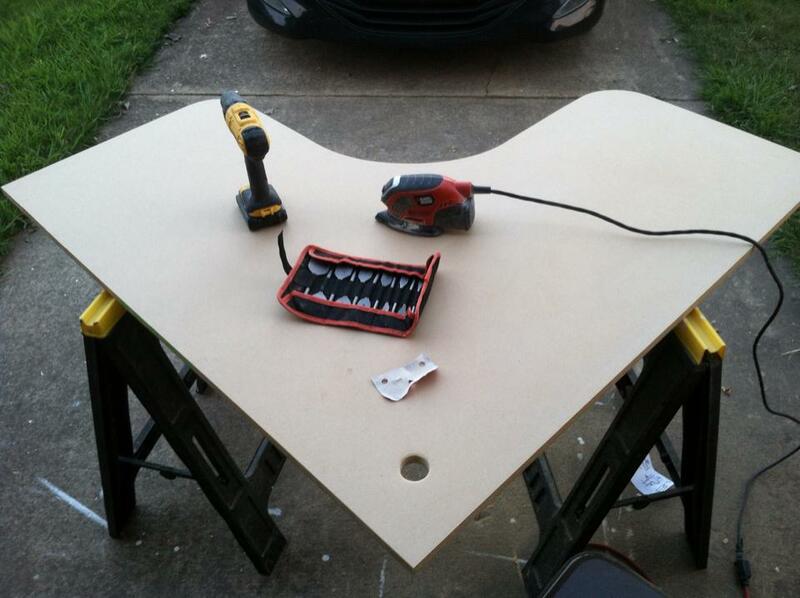 After the desk shelf units were built (2 tall bookcases, 2 short ones, and 2 rounded corner pieces) for the new workspace, I started drawing and cutting out the desktop. I wanted to go with a bit of a rounded surface (no sharp corners to accidentally hit) and a sturdy thickness. 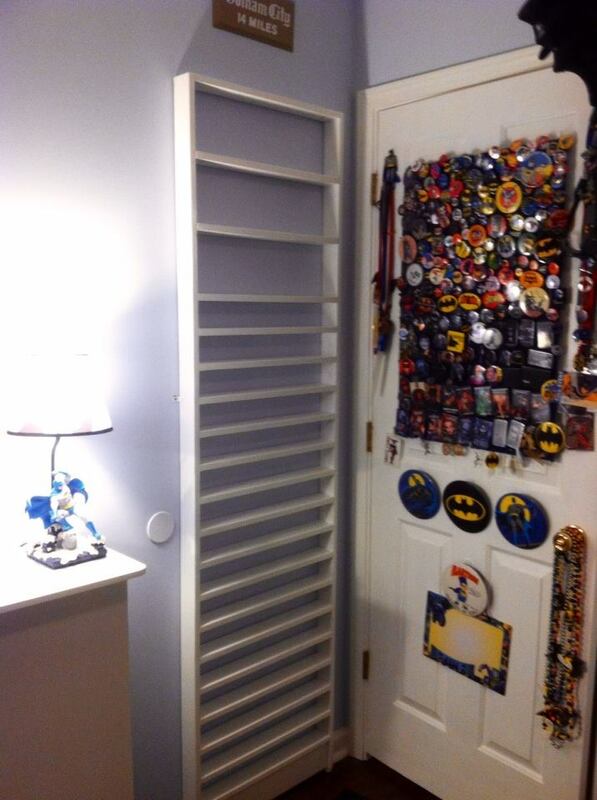 I had been using 1/2″ on the shelves, but went with 3/4″ for the top. Also cut out a top display shelf to go above the work surface and connect the two taller bookcases. 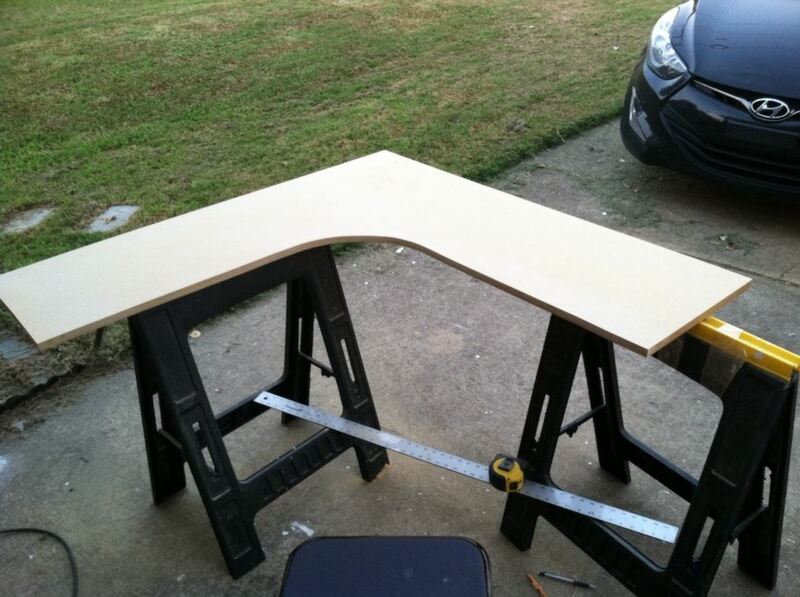 This was cut out of 3/4″ MDF as well, and then supported along the back and sides when installed. 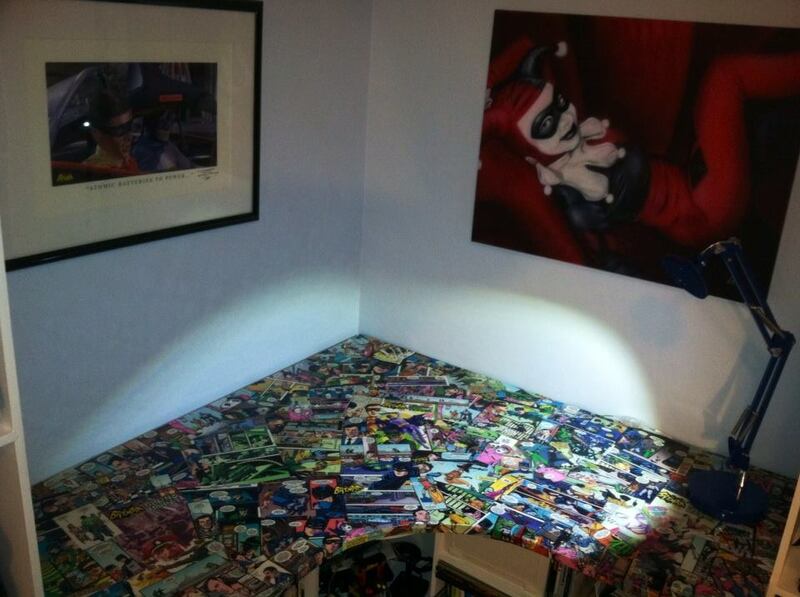 Nicki had suggested I decoupage the top of the desktop with comic pages. 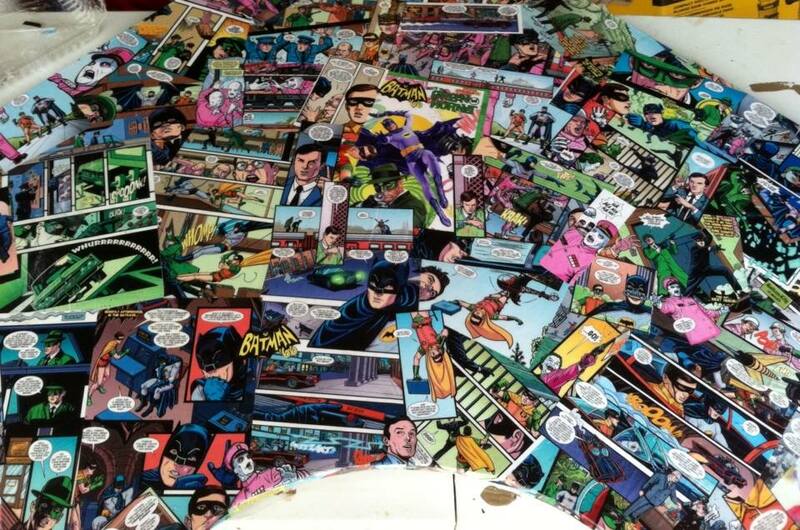 After finding some old Batman comics that weren’t in the best of shape and each worth less than a buck, I started cutting and pasting. Unfortunately the wind kept wanting to show up whenever I was ready to start laying down comic pages. Ugh..! 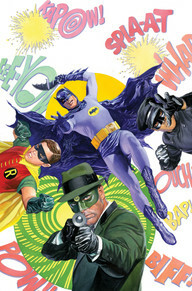 I wasn’t happy with my first attempt, so I flipped the piece over and started again with some recent Batman ’66 Meets The Green Hornet comics. They were written by filmmaker Kevin Smith and actor/comedian Ralph Garman with interior art by Ty Templeton and covers by Alex Ross. 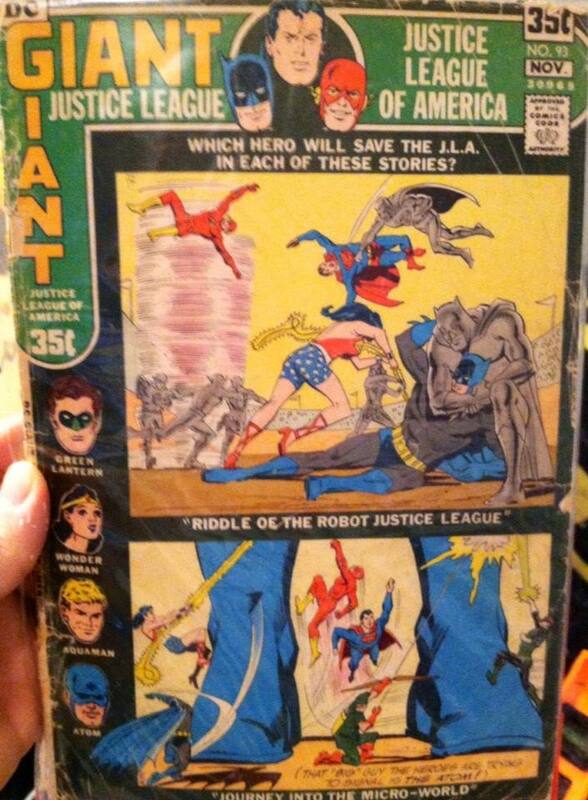 I bought a few extra issues just for this project. This time I was much happier with the results. The images were very bright and fun with lots of action and sound effects- and some great likenesses. It was also an enjoyable read! If you plan on doing any decoupage don’t rush it and plan things out. Nicki is planning on decoupaging some shoes with old comic pages which should be cool! Under the desktop were the two smaller shelves flanked by the taller twin shelves, and anchored in the middle by two rounded corner shelves. 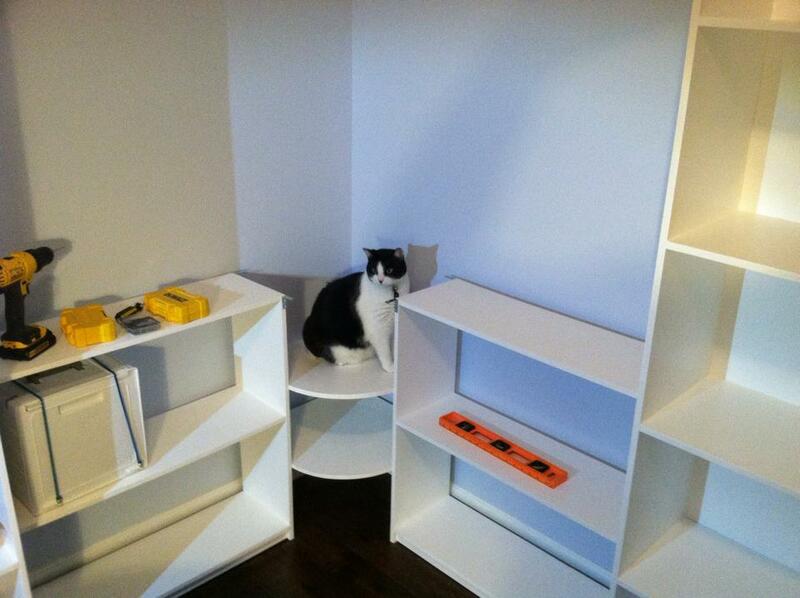 My cat Harley Quinn helped stress test the shelves! The two small shelves now hold my scanner/printer on the top left, markers and other drawing supplies on the top right, and art books along both bottom shelves. The middle corner shelves are held up and secured to the other shelves by “L” brackets and hold my external hard drive and Atari Flashback video game system. I cut rounded holes in the back corner of them and the desktop for computer wires and cords to go. It’s a very functional work-space with room for my laptop, Wacom tablet, and light box. 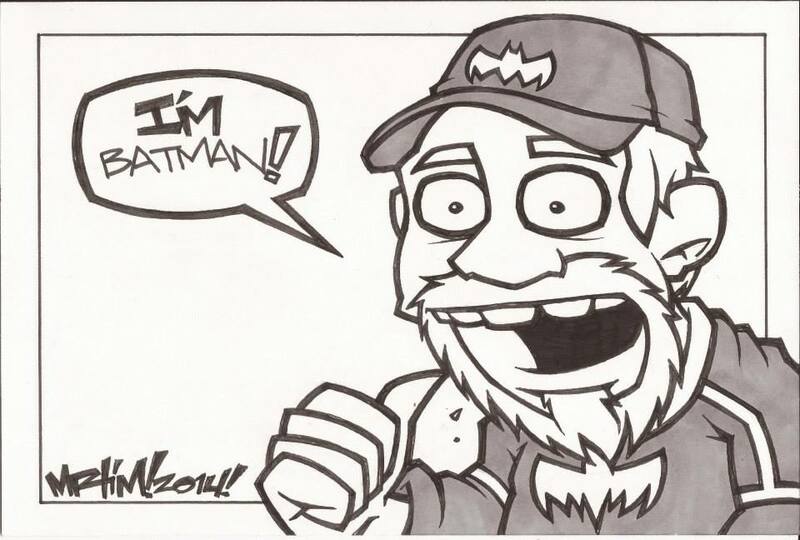 I like having my markers and scanner underneath and quick to get to. The Harley Quinn painting is one I airbrushed a couple years ago. 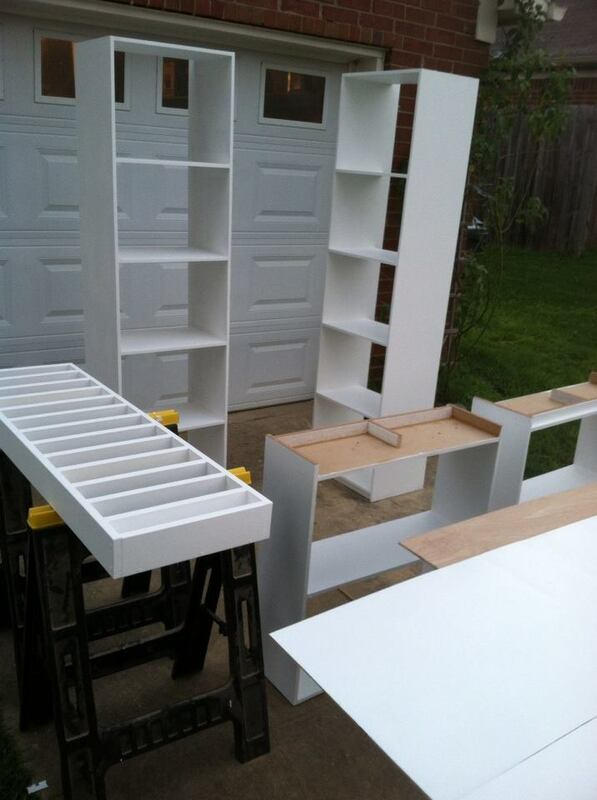 This is the workstation space with side, bottom, middle, and top shelving all in place. I’ve since moved the marker bins to the right side and installed a printer/scanner on the right under the desk. 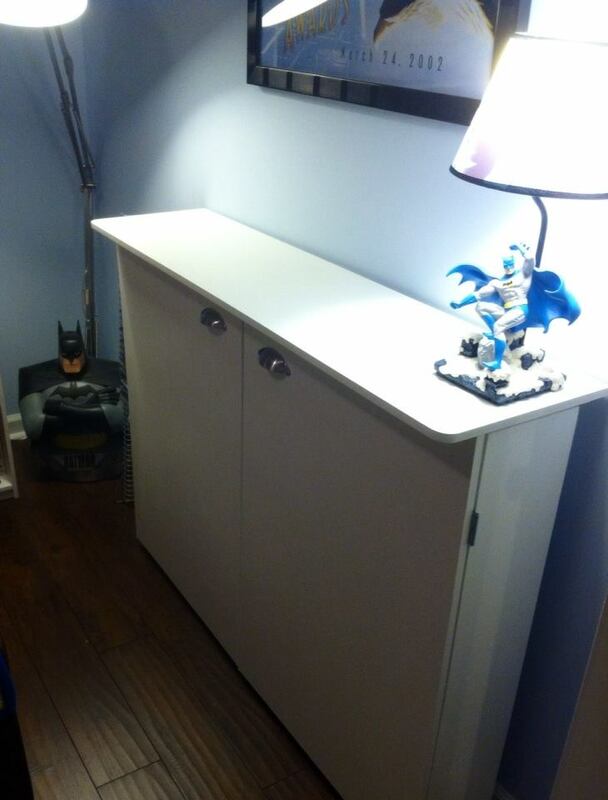 I also added a corner shelf above the TV and 3 touch lights to the underside of the top shelf and one under the desk. I’m not an electrician, so they are battery operated and stay in place with magnets. 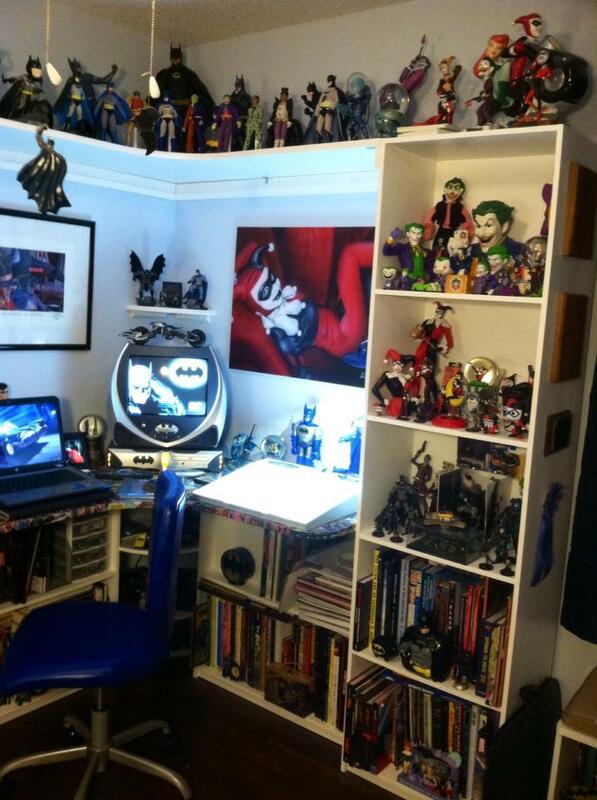 I do have one desk lamp behind my light box (not shown in photo). Still need to add a piece of trim to the big top shelf. 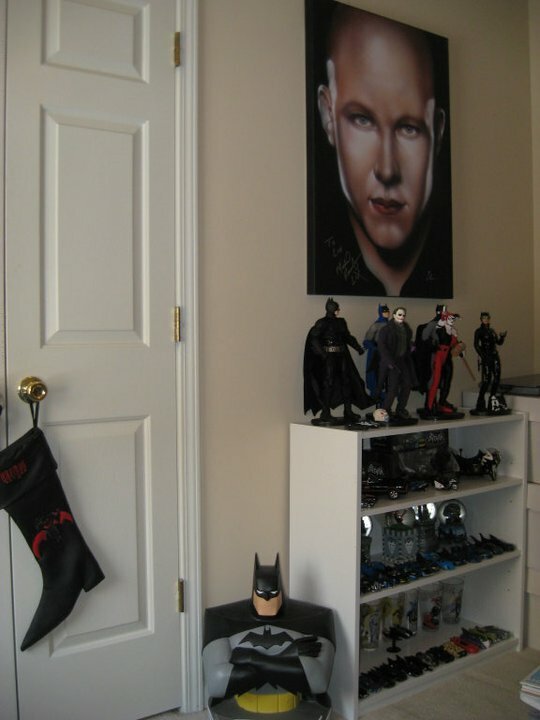 The Batman cell above the light switch is one I won from Zeke “The Animal” Logan by calling into his evening radio show on Rock103 while I was working late one night at my old t-shirt shop. 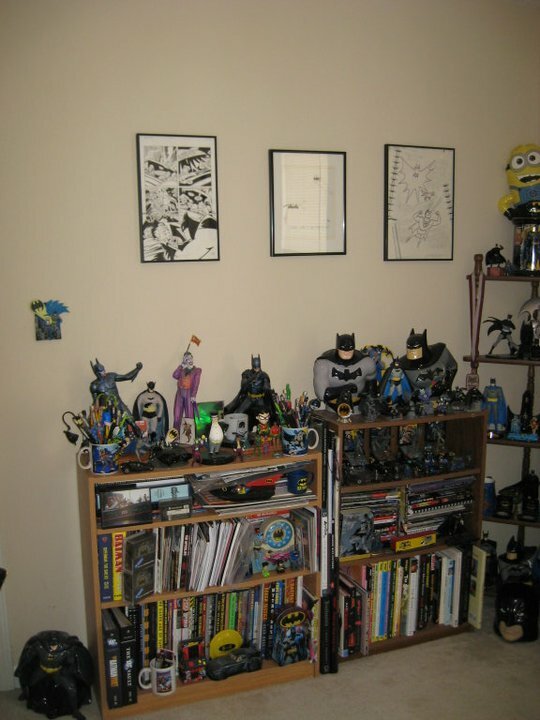 Have got some Clay Art Batman cookie jar, bank, and salt/pepper shakers, 12″ action figures, 18″ NECA Keaton/Batman, model kits, and other collectibles along the top shelf. I also built a cabinet to house all of our superhero movies. I didn’t realize just how many Nicki and I had between us! Unfortunately there now isn’t any room for any VHS copies, so I keep my favorites in a small ottoman and reserve this cabinet for just Blu-rays and DVDs. 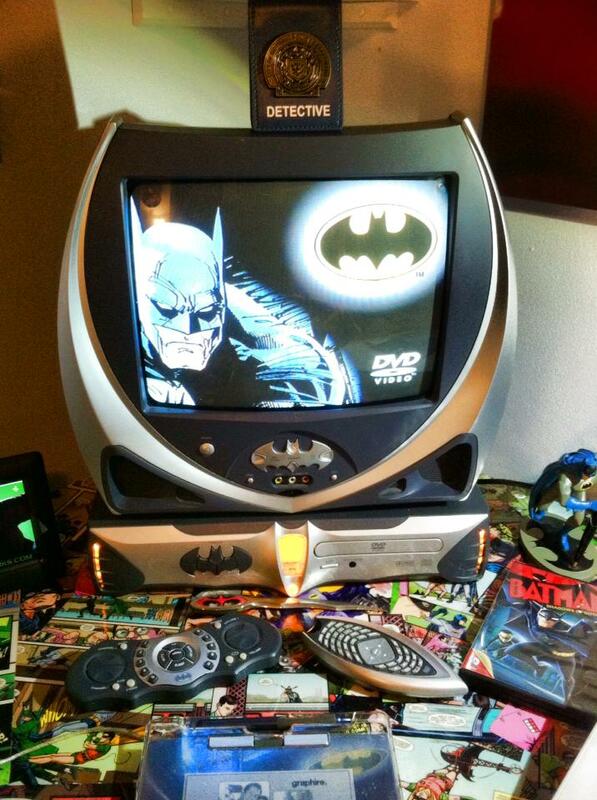 Speaking of DVDs, Nicki bought the ’60s Batman TV show set for me, and I got to watch in on my new DVD player and BAT-TV. I was going to go with a small flatscreen and put the DVD player underneath on one of the middle corner shelves, but when one of Nicki’s co-workers was wanting to sell the combo CHEAP- well, I couldn’t resist. 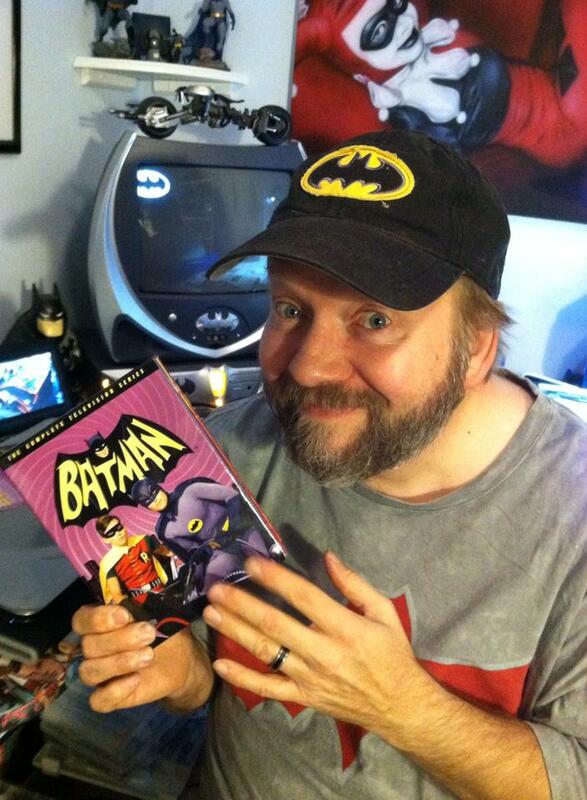 I really dig it, especially the screensaver and bat-shaped remote control! Nice to watch a video while I work. The top of the movie cabinet was used for display space (I miss the Warner Bros. Store here), and we bought a larger fold out sleeper ottoman to go in front of the cabinet. It’s on casters and can roll out of the way when we need to get a movie, or fold it can fold out if we have any guests spending the night at Casa Workman. The cats really seem to like the new ottoman and rug, and Jarael was first to claim it as hers. If the door is open she’s usually asleep on it. I think she likes the height and fuzzy bat-blankie. I tried to pull in some silver into the room, so I ordered a new floor lamp on-line and bought a new silver CD stand. It holds all my superhero movie soundtracks and sits next to the movie cabinet. The big Batman bust under the lamp is an old WB Store purchase, as are the Batman and Robin Super-Friends maquettes and the larger Batman with a batarang statue and the Batman/Robin bookends. 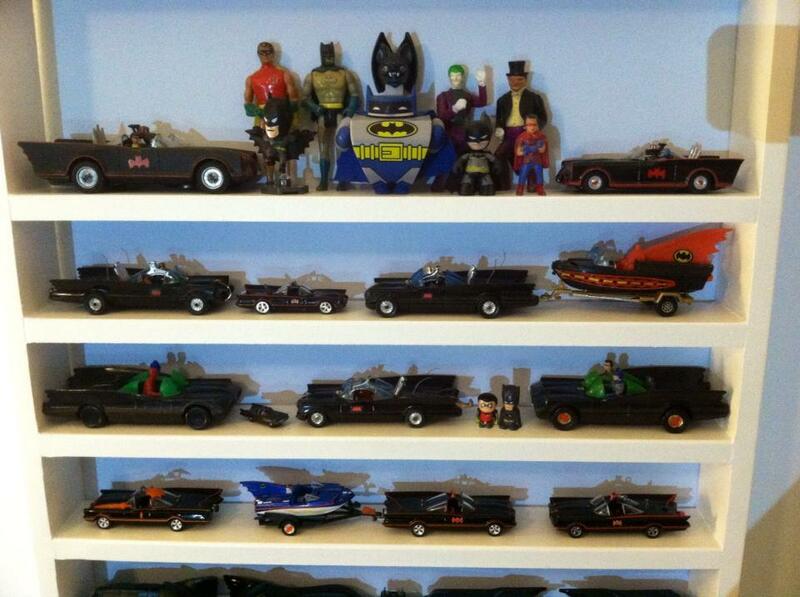 I really wanted to display as many of my Batmobiles as I could in my new room. I’ve got Corgi, Corgi Jr., Hot Wheels, ERTL, Duncan, Hallmark, and others in all shapes, styles, and sizes. Space was very limited in this 10’x10′ room, so I tried to figure out the best way to get the most out of it for displaying. 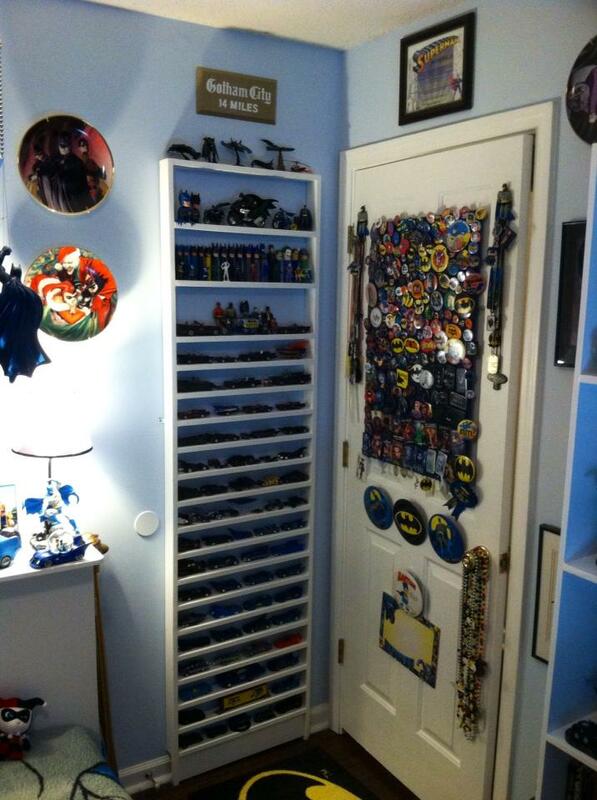 I first built the smaller wall shelf (the one by the window) for Batmobiles, but when it quickly filled up I decided to build a larger one and place it behind the door. It fit perfect! 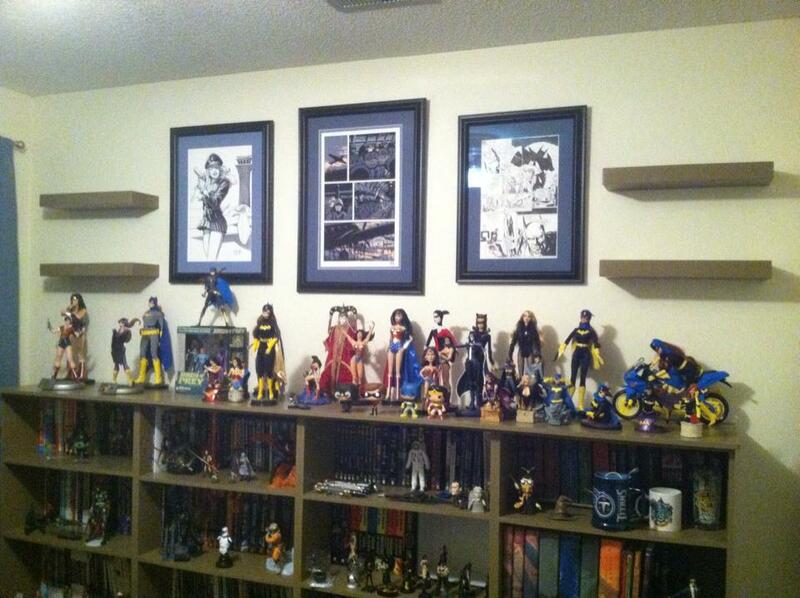 I also moved my “Gotham City 14 MILES” sign (made by Lee “The Bat-Fan” Johnson) above this shelf. I also replaced my button board (foam core board wrapped in blue fleece) and my animated Batman door hooks behind my door, and hung a few collector plates on the wall next to the shelf. 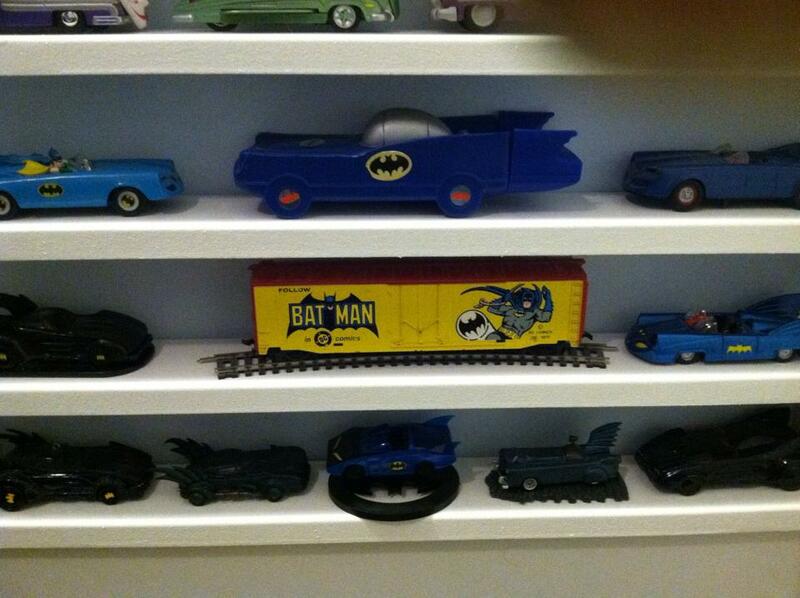 …and some of my favorite items like my 1977 train car and the Avon Batmobile shampoo bottle. 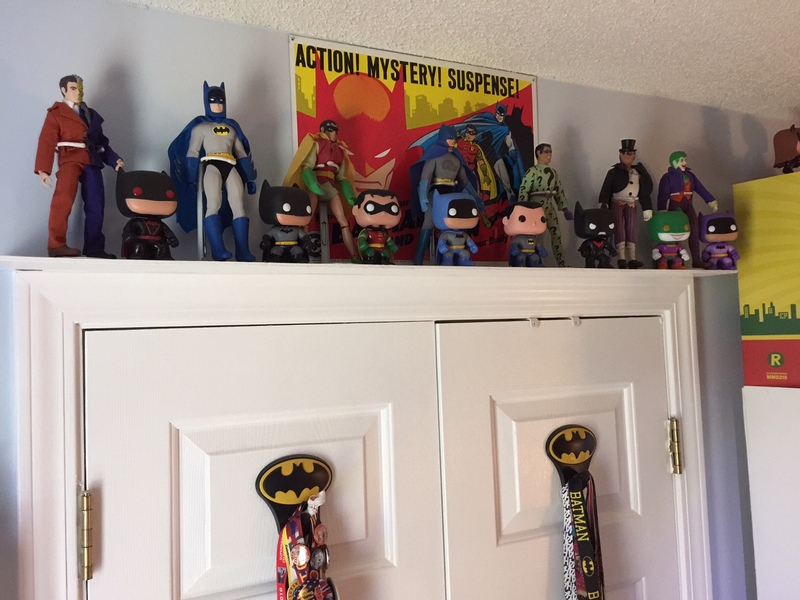 I bought a couple new bat-hooks for the closet doors, and hung my Metropolis lanyards on the left, and Batman lanyards on the right. 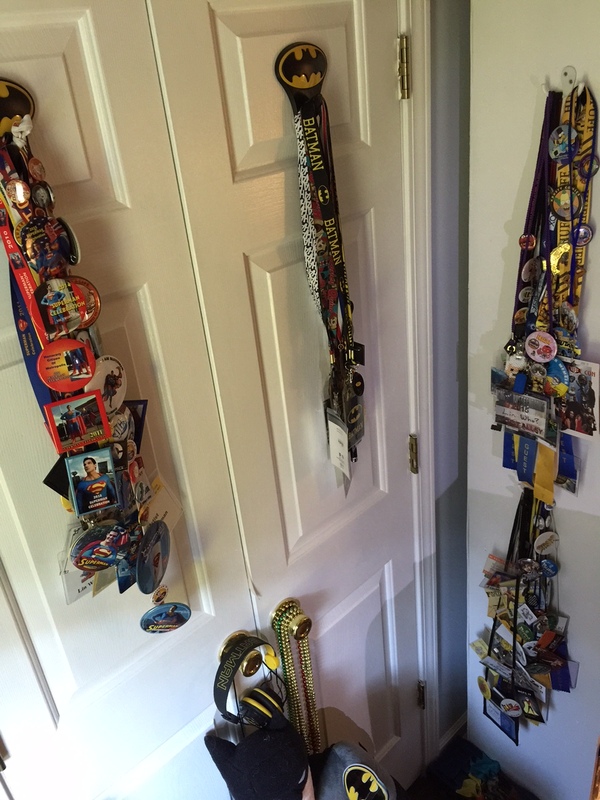 Yeah, I’ve been to a few conventions and other events over the years..! Above the closet door I added a small shelf for my Mego and Funko POP! figures. 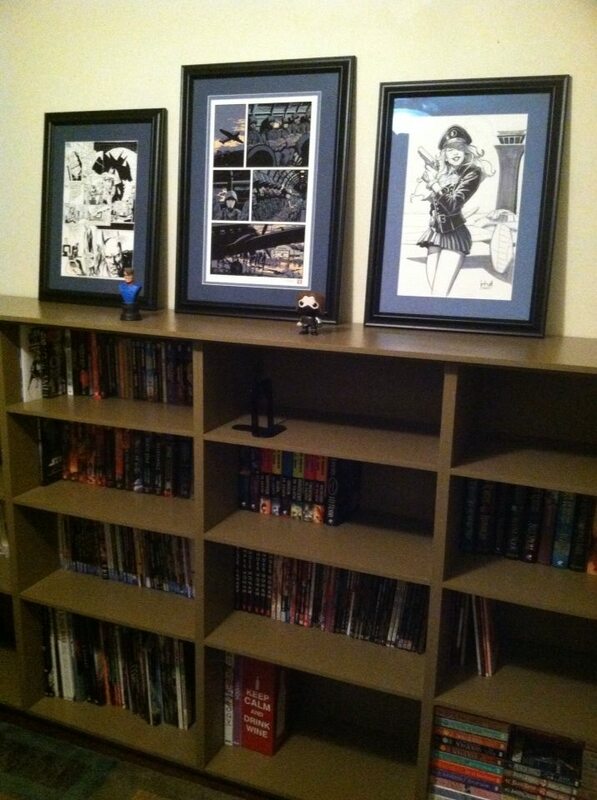 I still need to build a new shelf unit for in the closet, but for now I just moved one of my old pre-fab 3’x3′ shelves in it for the time being to hold extra books, sketchbooks, Treasury sized comics, and old 33rpm superhero records. I also have some magazine racks on top of it to hold my Airbrush Action, Amazing Figure Modeler, and Eaglemoss Batman Automobilia and DC chess piece magazines. The big shelf on the right of the closet was the first one we finished, and it was an amazing thrill to finally be able to move it into place. HUGE sense of accomplishment! 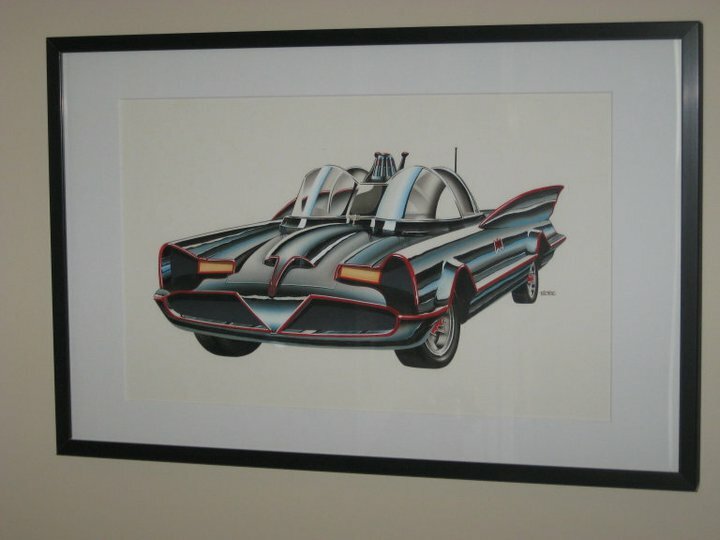 I hung some framed prints from the old Batman TV show/movie, Bob’s Batmobile painting, a photo of his Corgi scaled scratch built model Batcave, and a Our Valued Customers “You got Batmobile?” print. I ordered a couple plus some commissions this past Christmas. Scary how close the likeness is..! 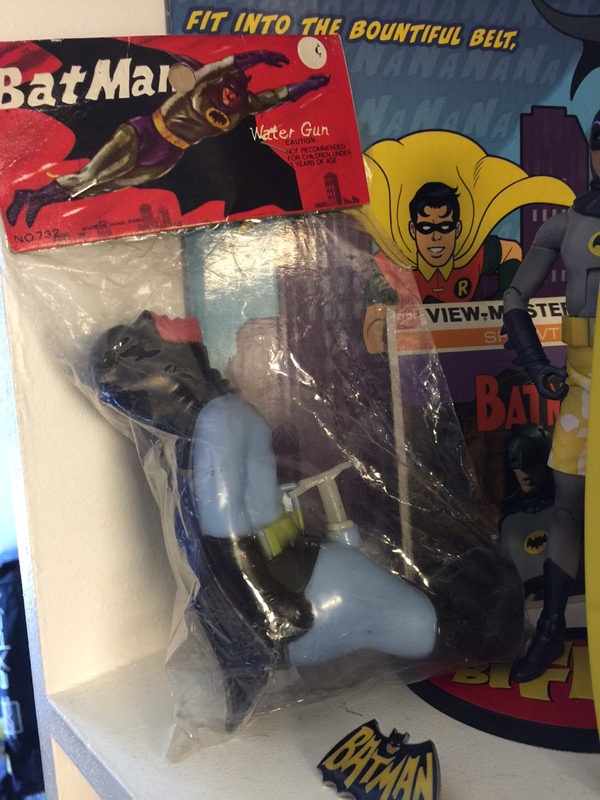 On the top shelves of the big display shelf there are LOTS of ’60s TV Batman items, including pairs of 12″ Hot Toys and 18″ NECA Batman and Robin, POP! 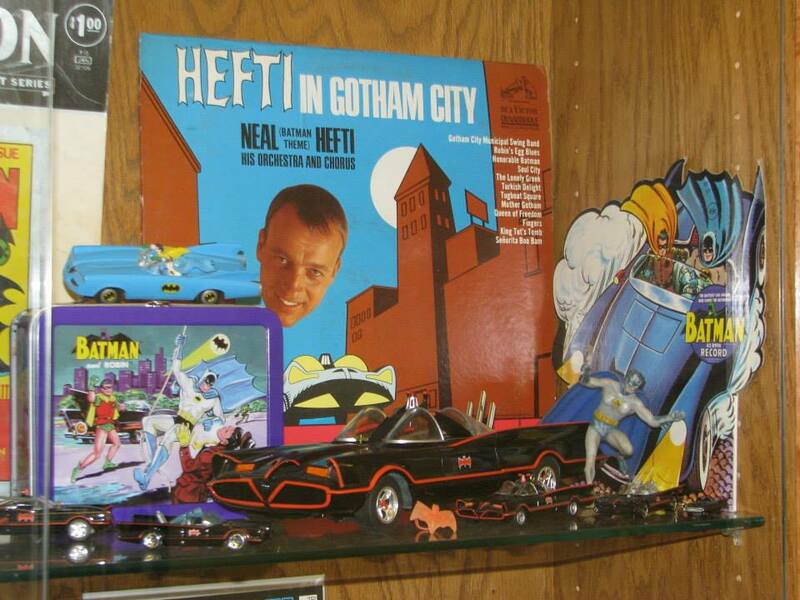 figures, resin bat-busts, Julie Newmar/Catwoman resin model kit, Catwoman and Batman Barbie dolls, large Hot Wheels Batmobile and Bat-cycle, Batman finger puppet, and a 1966 Ideal Bat-helmet! Always wanted one as a kid, and finally found one (center top) in great condition for a good price a year or so ago on eBay. 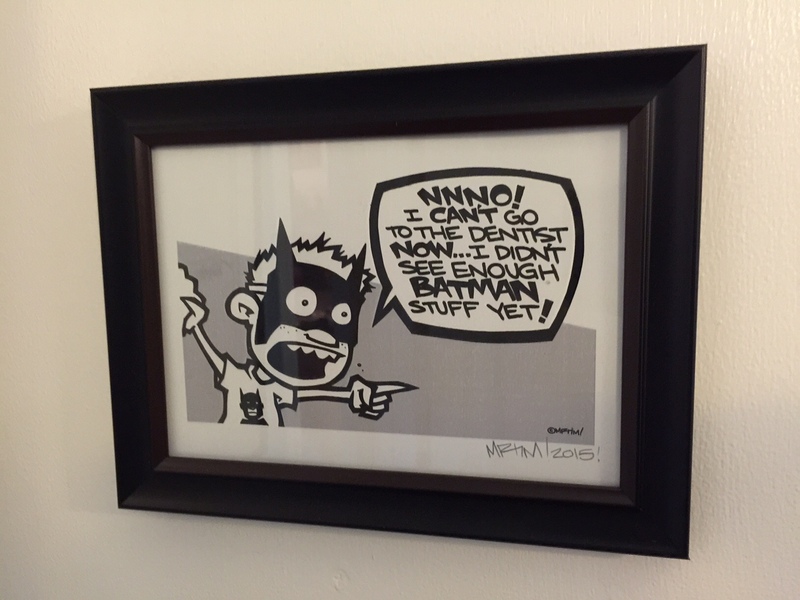 It’s one of my all-time favorite Batman items. 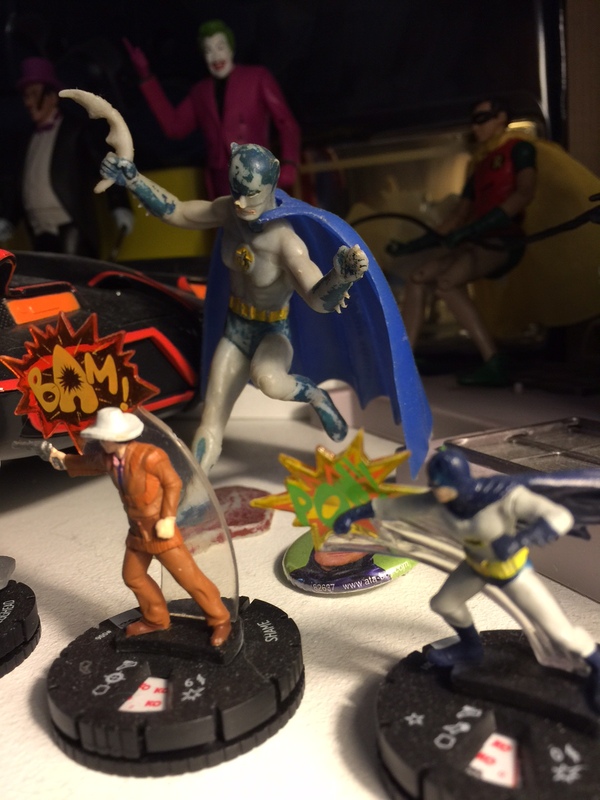 The next shelf down has several of the latest ’60s action figures, HeroClix, a wearable Bat-ulitly belt with Batarang, 45rpm records, slot cars, HotWheels, mugs, plant pot, and Eaglemoss bat-vehicles. I have over 50 of the Eaglemoss ones (so far), just don’t have room right now to display them all. Have a few from the Nolan movies and the Arkham games on shelves next to my desk, but that’s all that’s out for now. May rotate some out of the closet later. 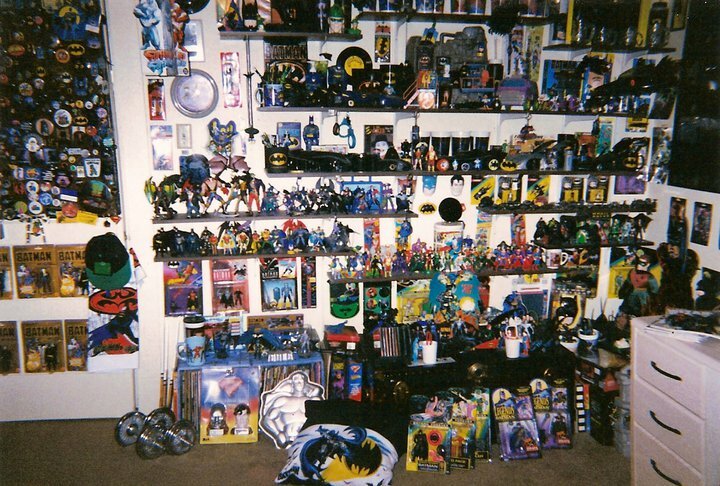 The older looking Batman figure that looks “well loved” in the center of the photo on the left was the first item in my Batman collection. Yep, that’s what started my bat-collecting obsession back in the late ’60s when I was a kid. I picked it out for my birthday cake that year. Recently I picked up one in better condition, but it can’t replace my first one. 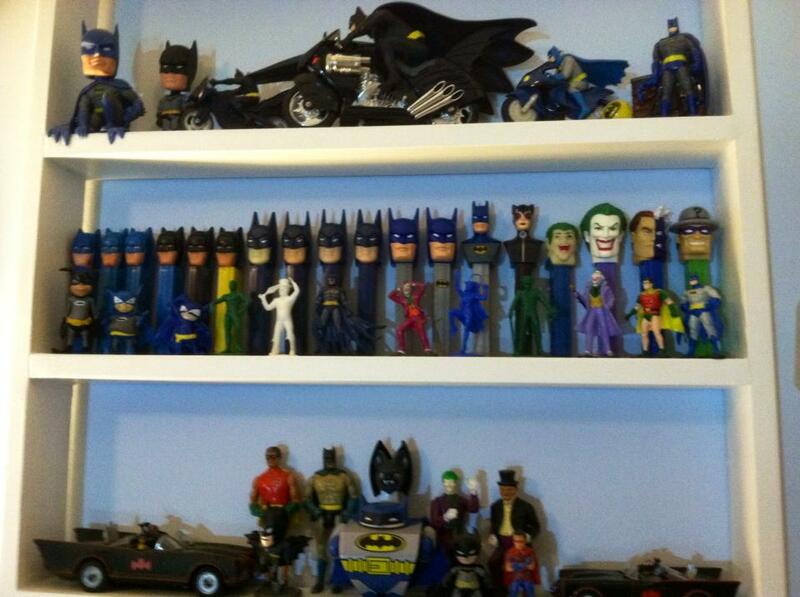 If I could only keep one bat-collectible that would be it. The water pistol in the photo on the right is probably one of my weirdest/funniest items in my collection. It’s very wrong, but I had to have one. There’s a View Master set next to it. LOVED View Masters as a kid and still collect them…when I can find them. The next shelf below (which doesn’t really sag like that- just a camera illusion) has some Figures Toy Company Mego style figures, Batusi action figure, mini lunchbox and thermos, plastic Duncan/Simms Batmobiles and Batboat, Batman and Robin alarm clock (a friend had one that would wake us up at sleepovers as a kid), and an autographed Robin batarang. The bottom shelf holds many bat-books. 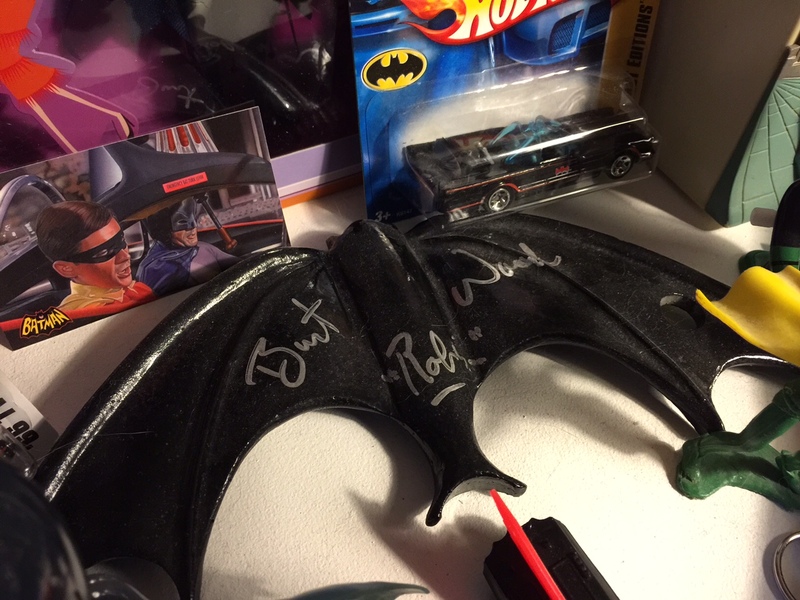 I got the resin batarang (above) from Bob during one of his moves and got it signed by Burt Ward at Adventurcon in Knoxville, TN a few years back. 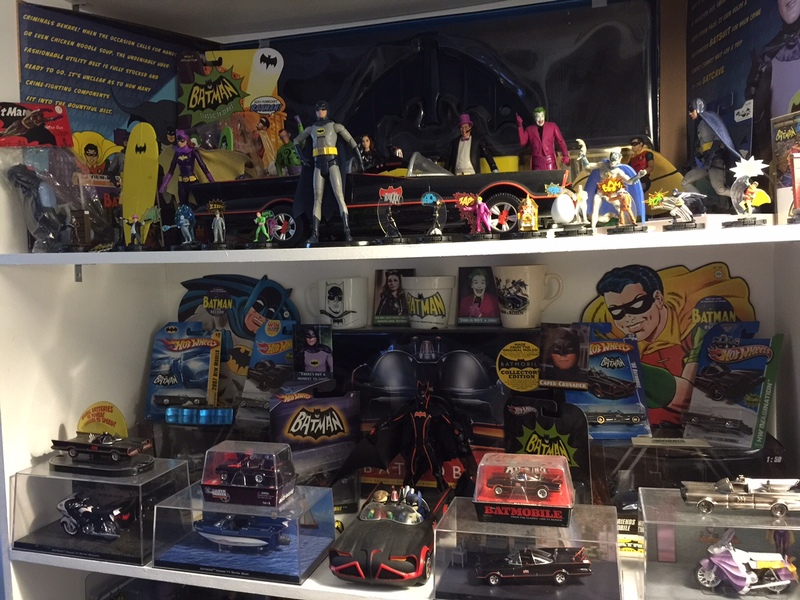 Lots more stuff to see in the Batcave, and I’m always adding more to it. 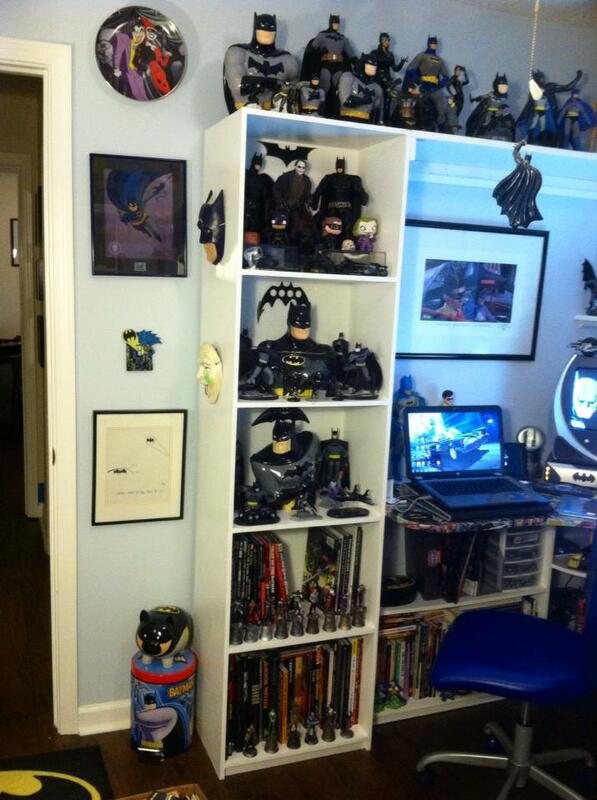 You can see the majority of my collection in the Batcave album on my Facebook page. I try to post pics of new items I acquire. 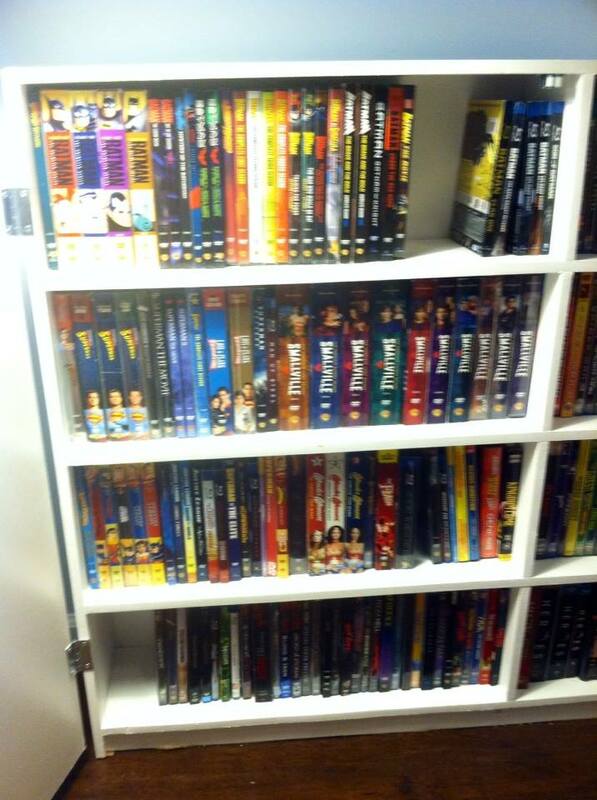 If you have a collection I’d love to see it. 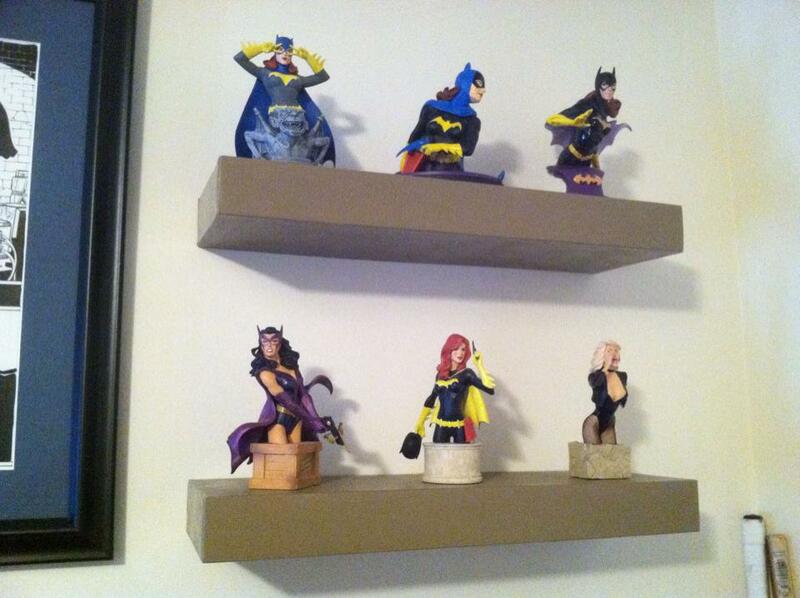 While building my shelves, I built some shelves for Nicki to display her collections in the Fangirl Room down the hall. 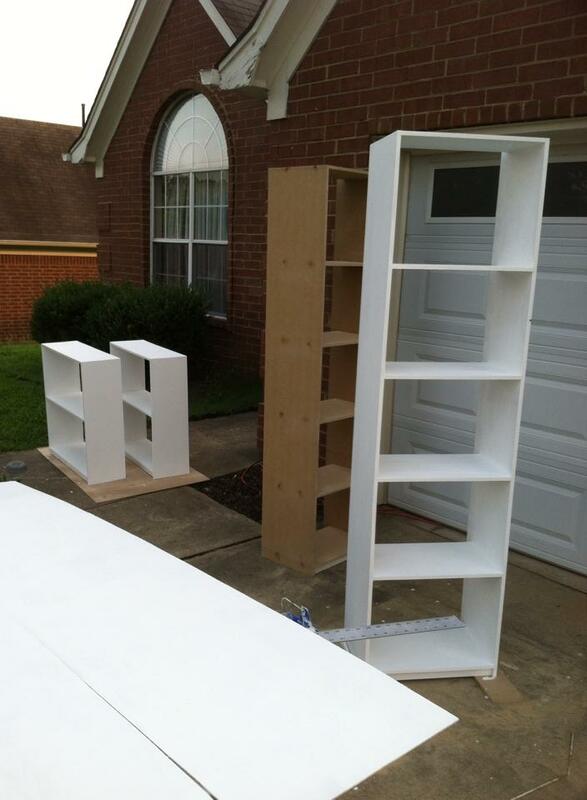 There are four separate units connected together, sitting on a raised base, and covered with a long topper shelf. It was all made out of MDF like my shelves, and like my desk it’s modular and can come apart if we ever move and want to take it with us, or the new residents would like it removed. I was really happy with how the four floating shelves turned out. I was a bit apprehensive about tackling the project, but Nicki seemed confident I could pull it off. I honestly wasn’t sure I could until we actually got them up on the wall! Let me tell you, it was a bit of a challenge, but Nicki was right as usual and I finished them. She was happy she could display more art on the walls and display more of her collection better. 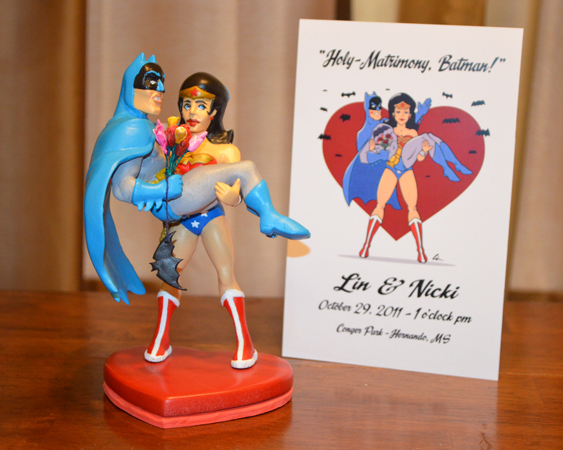 When we got married she inherited some of my Batgirl, Wonder Woman, Captain America, and Star Wars comics, art, and collectibles. 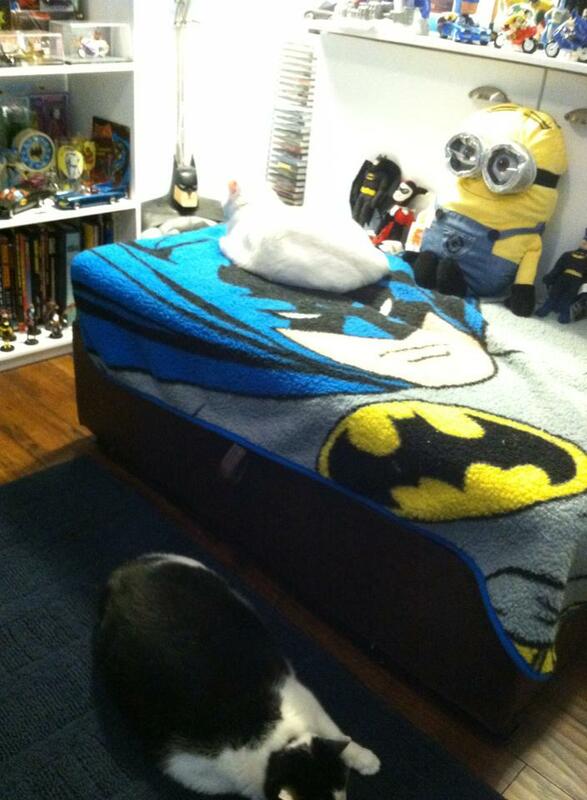 She claims it was my evil plot to take over her room as well! 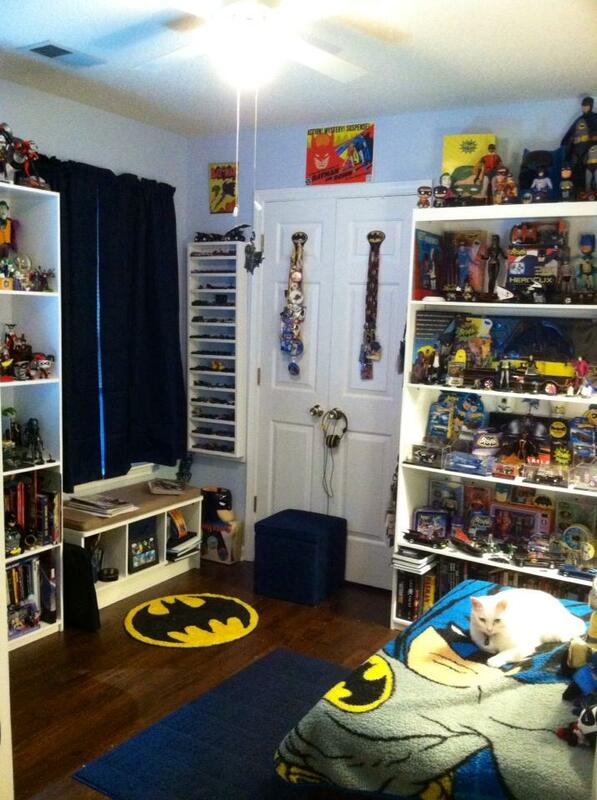 Hopefully she’ll post a blog about her room and some of her recent additions to it on her site Fangirl Wednesday. 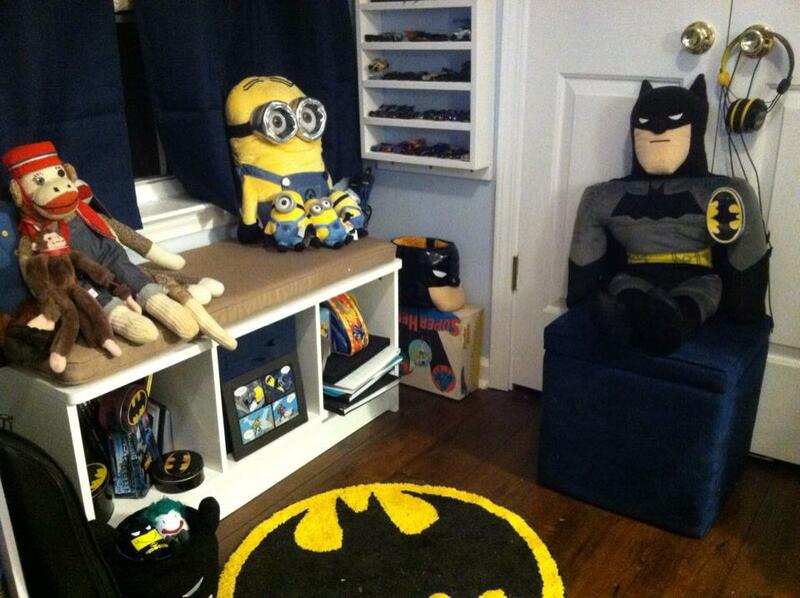 Hope you enjoyed this tour of my Batcave. Good luck to any of you who plan to do any home improvements. We’ve still got several more to do around here, but will tackle them one at a time.